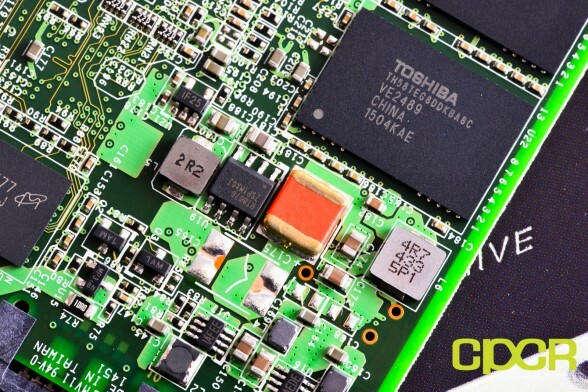 CES 2015 was a pretty big show for the entire storage industry as a whole and OCZ in particular had a strong showing this year with the unveil of their highly anticipated JetExpress controller. 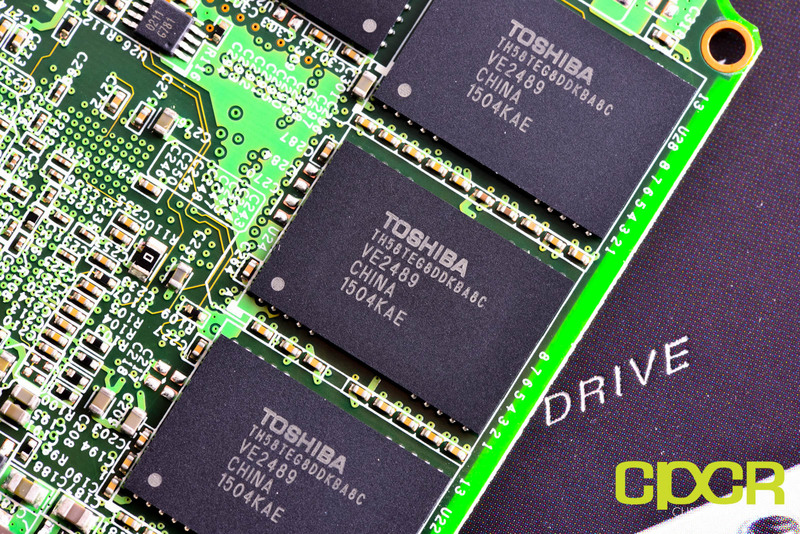 Along with JetExpress, OCZ was also proud to say that they’re now putting the final touches on their integration with Toshiba which includes converting their entire SSD lineup to utilize Toshiba’s latest A19nm Toggle Mode MLC NAND. Although OCZ’s Vector series drives have been using Toshiba first generation 19nm Toggle Mode MLC since the Vector 150 was launched in late 2013, it’s now finally being replaced with the OCZ Vector 180 which bring it in line with the rest of OCZ’s lineup utilizing Toshiba second generation A19nm Toggle Mode MLC. 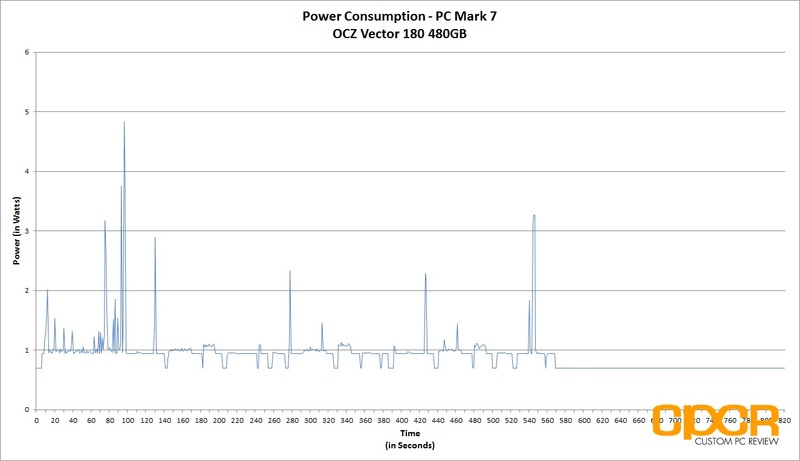 Of course, the NAND update isn’t the only thing new about the OCZ Vector 180. 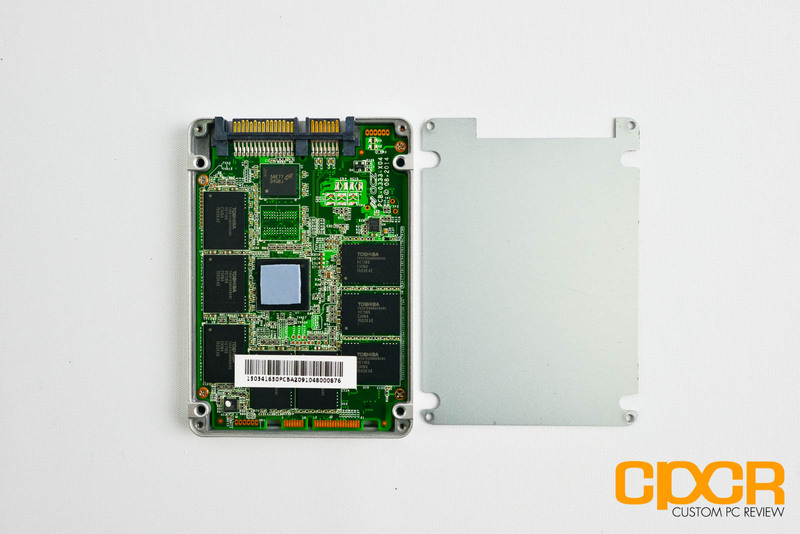 It’ll be now offered in capacities of 120GB, 240GB, 480GB, and for the first time, 960GB. 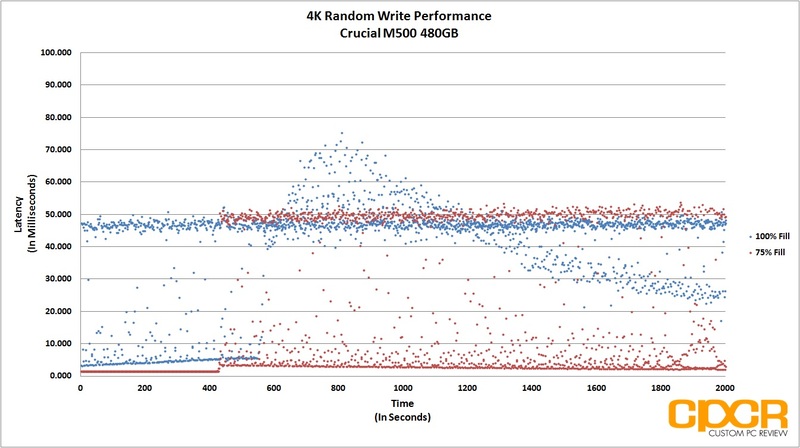 Sequential read performance is rated at up to 550 MB/s across the board while sequential write performance is rated at up to 450 MB/s for the 120GB capacity and up to 530 MB/s for the 240GB, 480GB, and 960GB capacities. 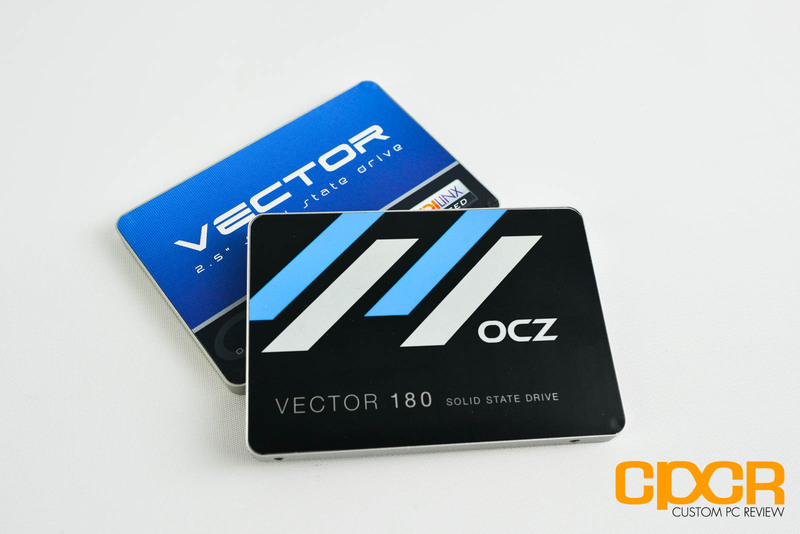 Internally, the OCZ Vector 180 will be similar to its predecessor, the OCZ Vector 150. 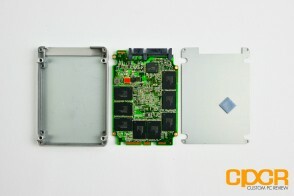 It’ll continue using the Barefoot 3 M00 controller which is same controller used in the original OCZ Vector launched back in late 2012. 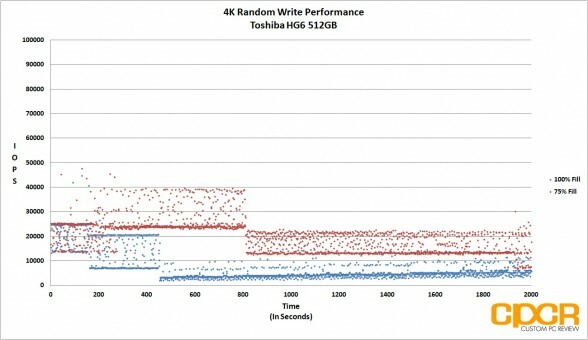 As I mentioned earlier, OCZ has updated the NAND onboard to Toshiba’s latest A19nm (second generation) Toggle Mode MLC. 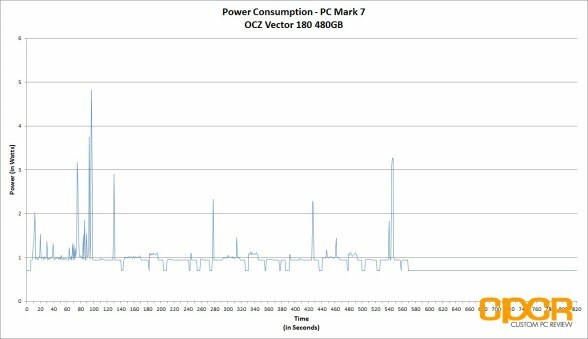 New for the Vector 150 is also partial power loss protection, a feature OCZ calls Power Failure Management Plus (PFM+), which we’ll get into a bit later. 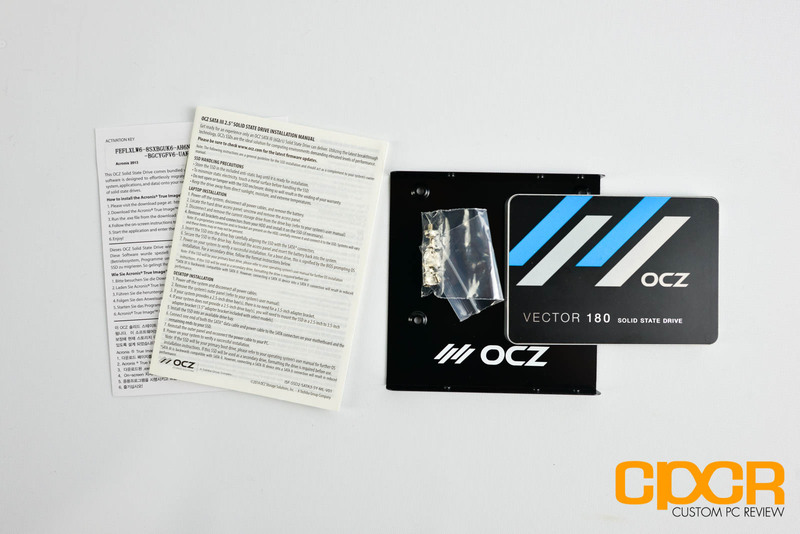 Here’s a look at the packaging for the OCZ Vector 180 480GB SSD. Included in the packaging we get some documentation, an Acronis TrueImage HD key, a 2.5″ to 3.5″ adapter with screws, and the OCZ Vector 180 itself. 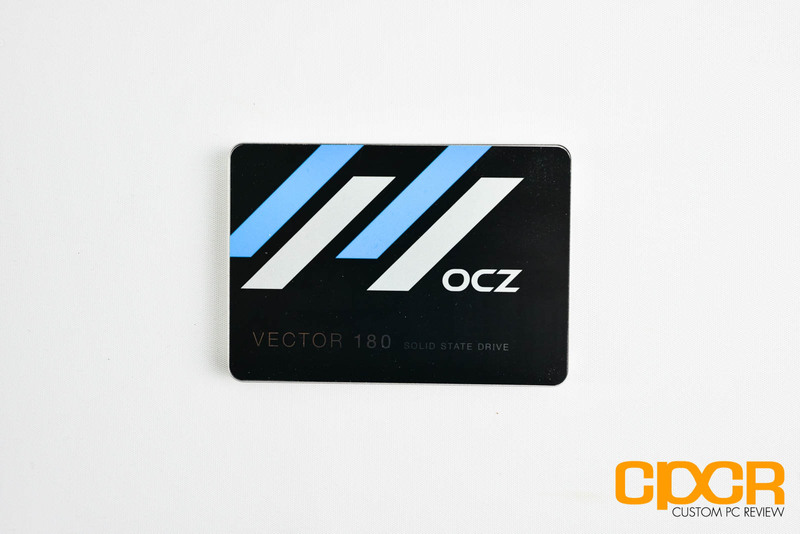 Here’s a closer look at the OCZ Vector 180 480GB. 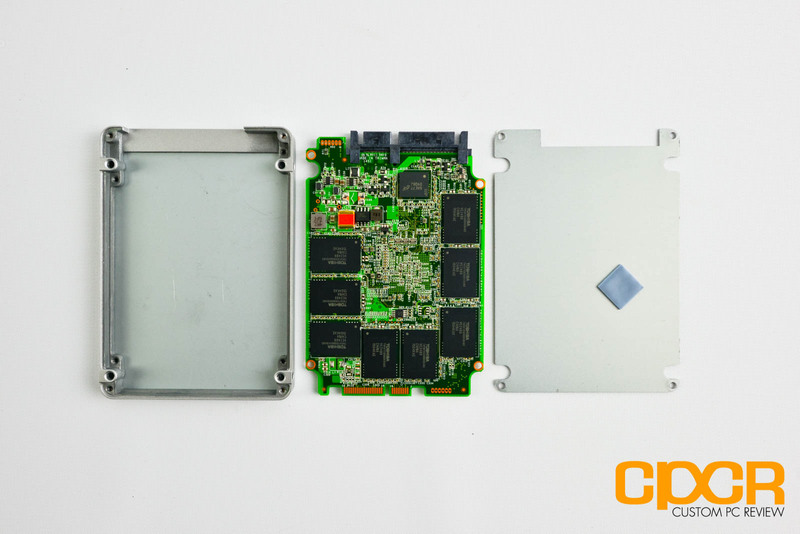 The metal casing and overall design is pretty similar to what we’ve seen since the original OCZ Vector several years back. The controller onboard the OCZ Vector 180 is the same Indilinx Barefoot 3 M00 (IDX500M00-BC) that was first introduced to the market with the original OCZ Vector. 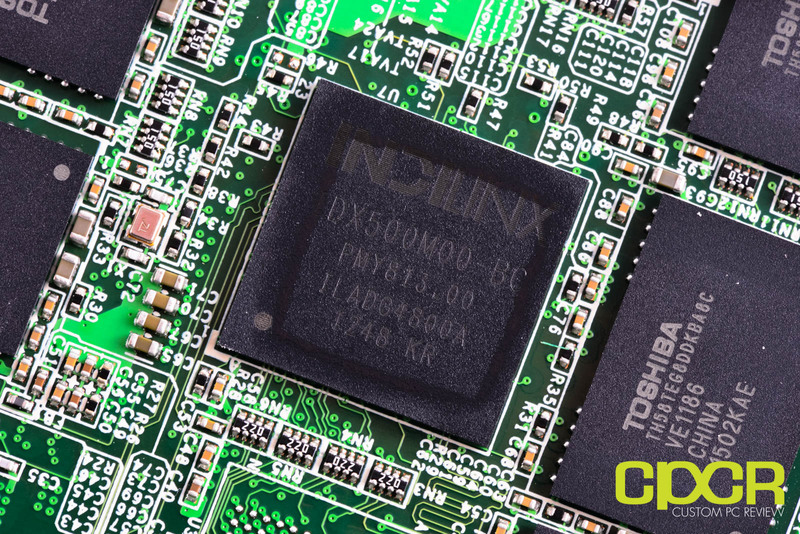 It’s definitely getting a bit long in the tooth here as it still doesn’t have some of the more modern features of newer controllers such as advanced power management, TCG Opal encryption support, etc. That said, back at CES OCZ has announced plans for a new SSD controller, JetExpress, which is expected to launch within the next few months. 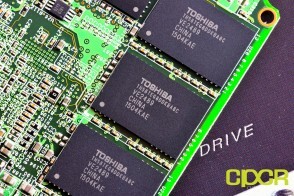 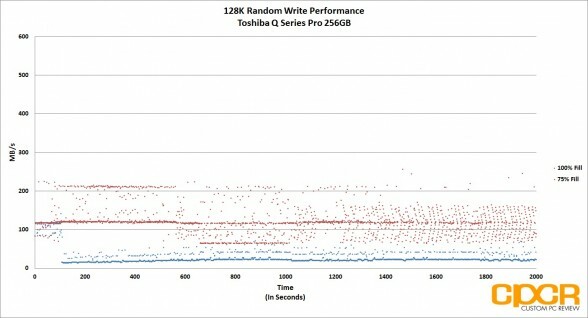 NAND onboard the OCZ Vector 180 is Toshiba’s A19nm (second generation) Toggle Mode MLC. 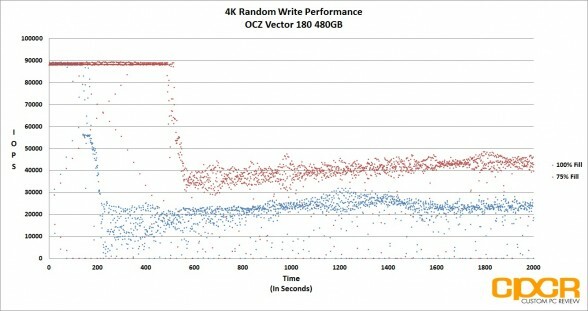 OCZ’s previous Vector 150 SSD was among the last of OCZ’s drives to continue using Toshiba first generation 19nm NAND. 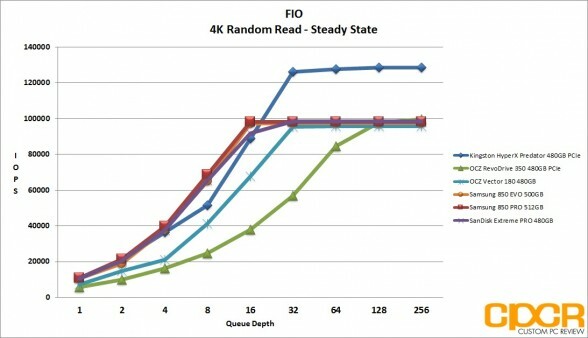 OCZ is using a total of 16 packages of NAND for a total of 512 GiB. 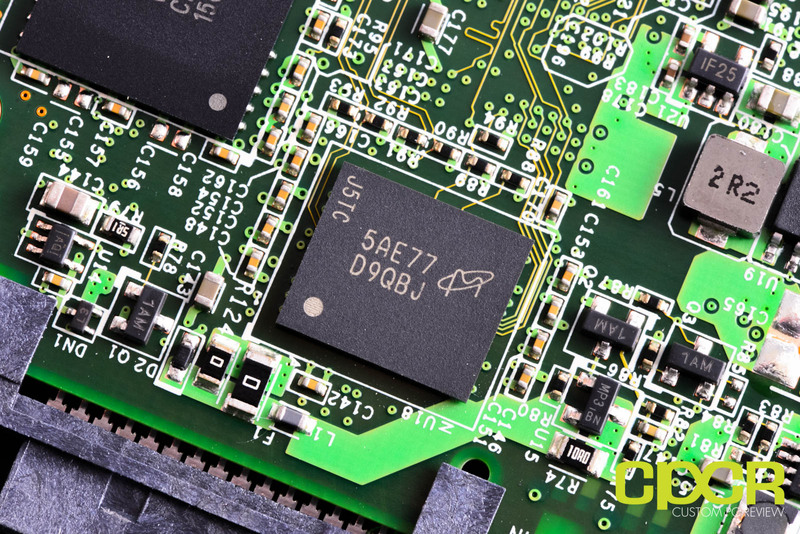 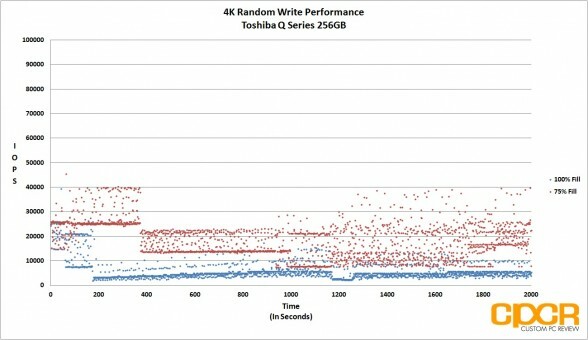 For the 480GB model, OCZ is using NAND chips with 64Gb dies while the 960GB model will use NAND chips with 128Gb dies. OCZ also packs two Micron DRAM chips onboard giving the drive a total DRAM buffer of 1GB. The newest feature for the OCZ Vector 180 Power Failure Management Plus (PFM+), which is a fancy way of saying partial power loss protection. Unlike full enterprise power loss protection systems which protect both data at rest and data in flight, partial power loss protection only protects data at rest which means flushing mapping table information, ensuring existing user data is safe and ensuring onboard firmware data stays intact as well. 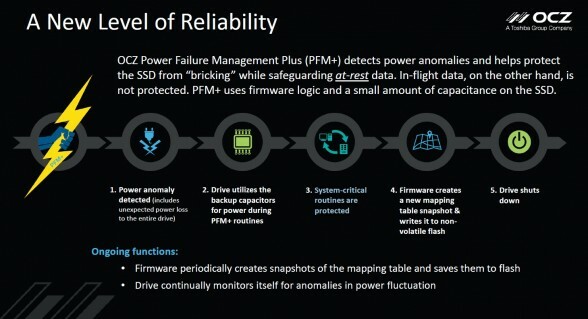 While it’s not common occurrence, any sudden power loss event on a drive without power loss protection does have the potential of bricking a drive or corrupting onboard data. 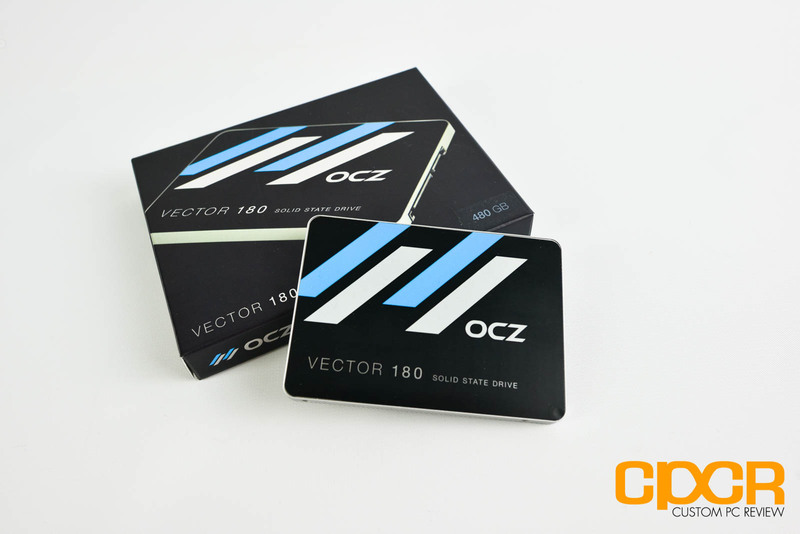 Today we’ll be reviewing the OCZ Vector 180 480GB with firmware 1.01. 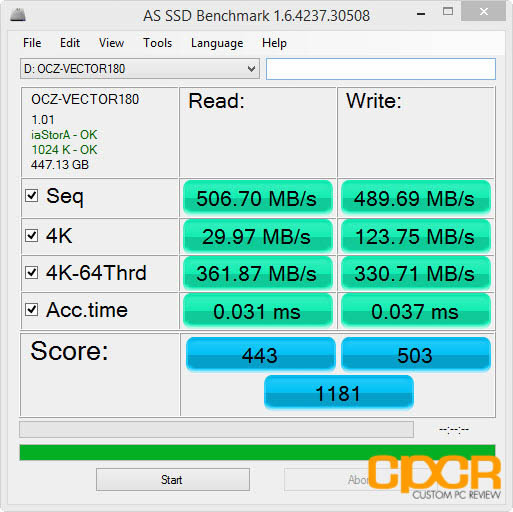 Along with the Vector 180, OCZ is also launching SSD Guru, which is a slick new software suite designed for OCZ’s Barefoot 3 powered drives and the RevoDrive 350. 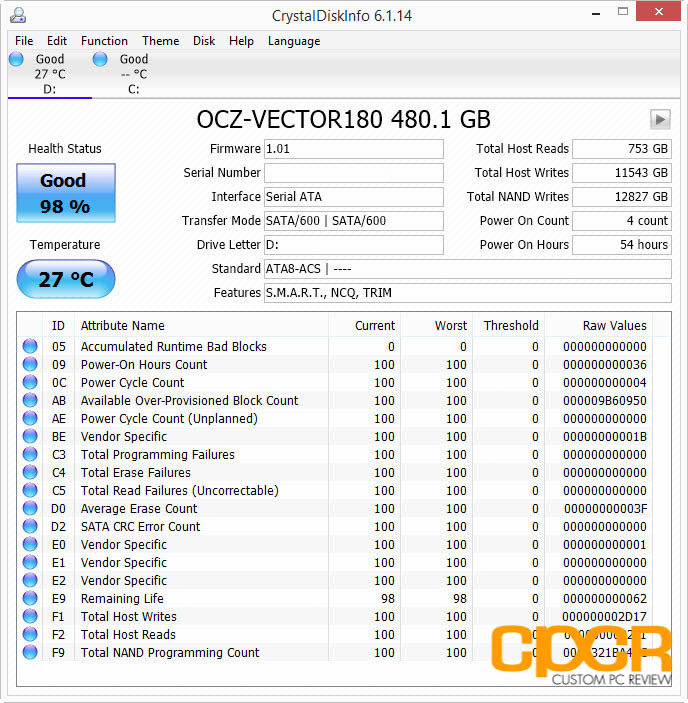 SSD Guru is a fairly standard in terms of features for a software suite and gives users all the basics including information about their SSD, ability to TRIM the drive, ability to further overprovision their drive, perform a secure erase, perform firmware updates, etc. 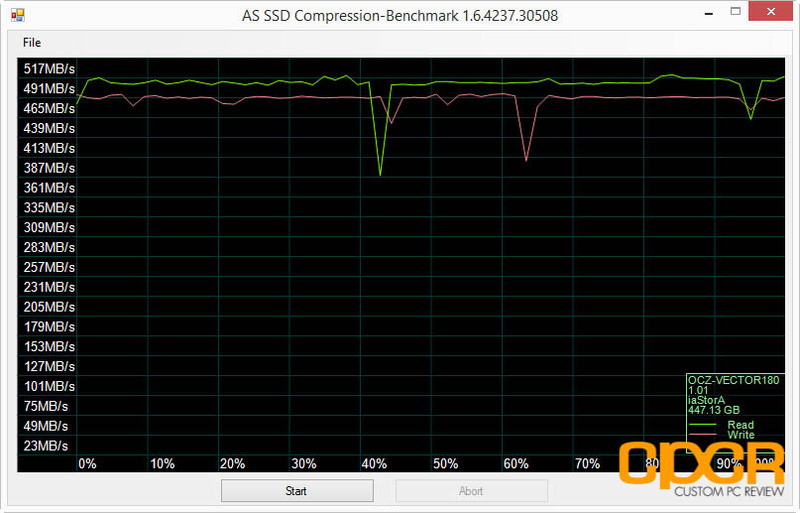 As usual, we kicked off our testing with ATTO Disk Benchmark. 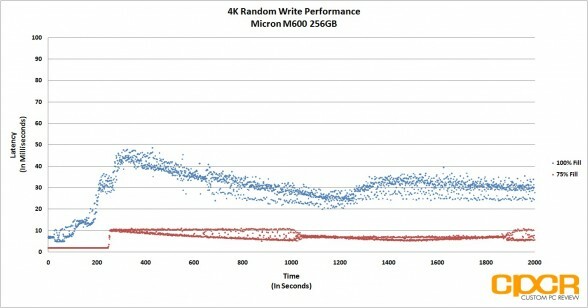 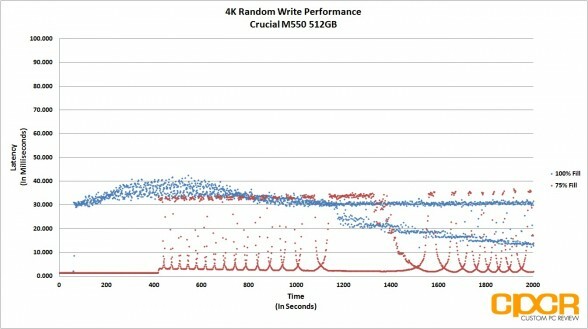 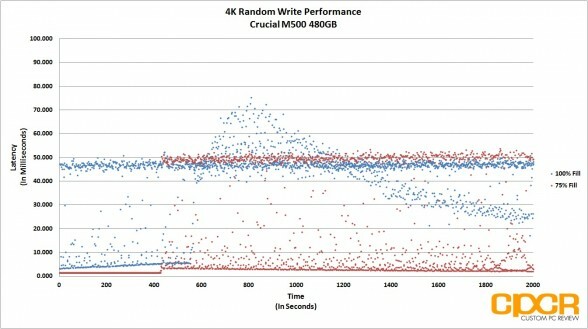 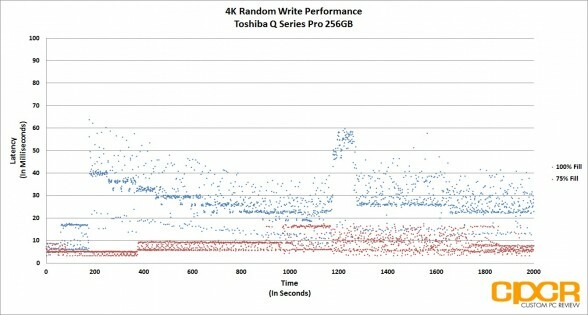 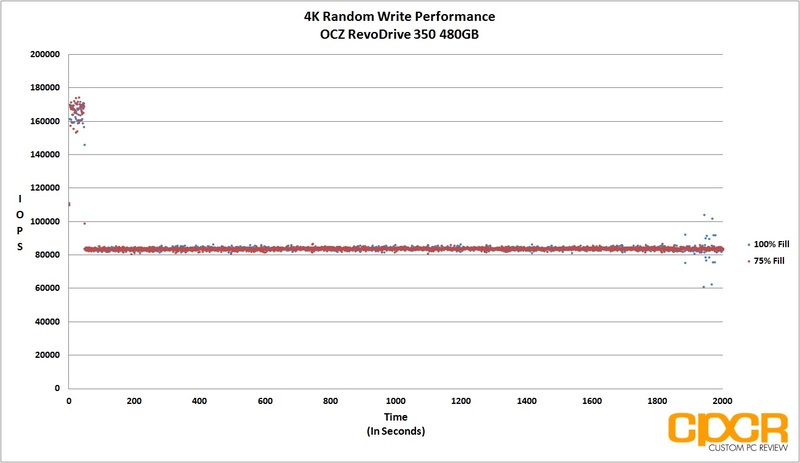 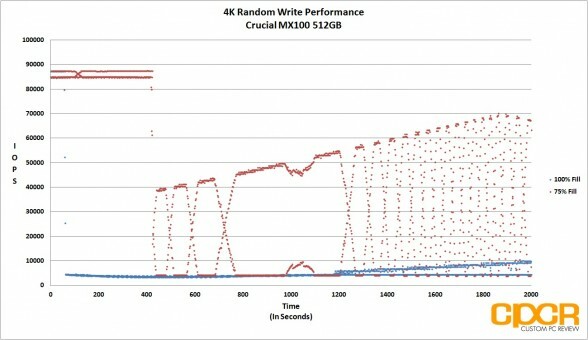 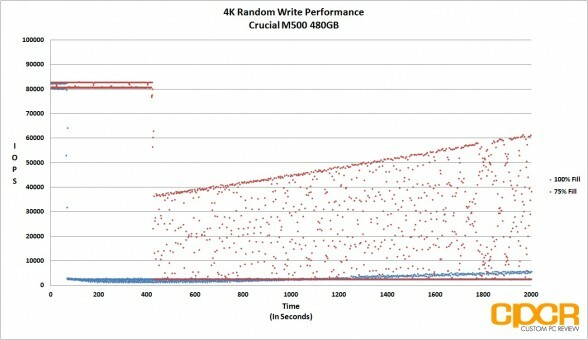 Overall the results were decent with sequential read/write performance reaching a maximum of 550/521 MB/s respectively. 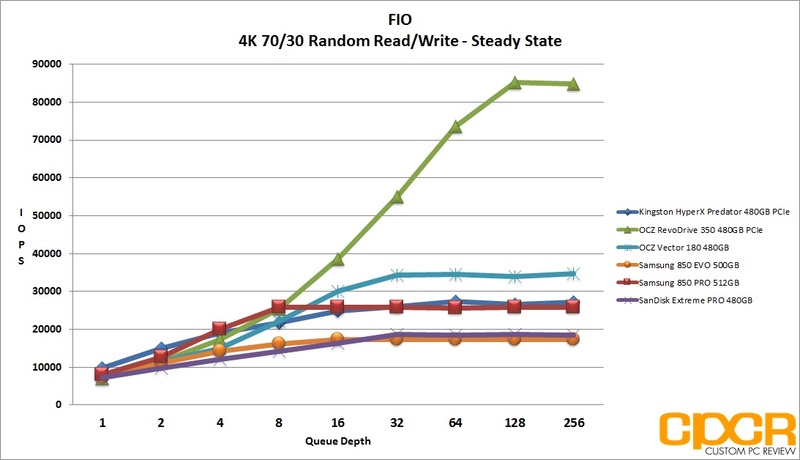 That said, there were some strange drops in read and write performance which occur at different block sizes and at different queue depths. 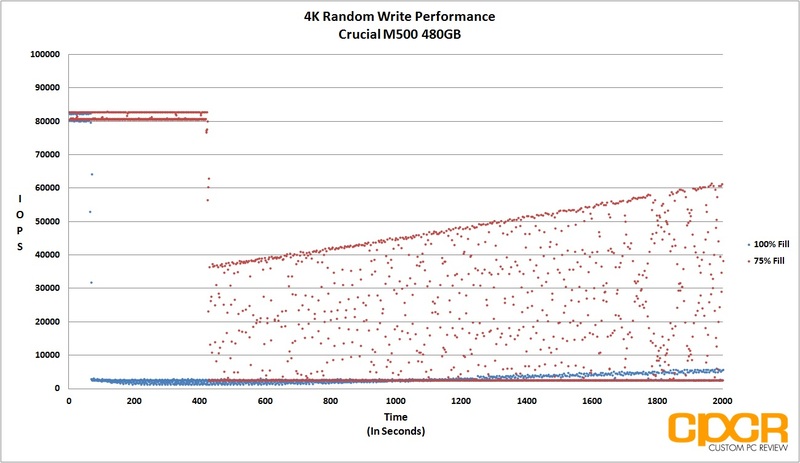 AS SSD performance is solid with the drive reaching a maximum sequential read performance of 507 MB/s and maximum sequential write performance of 490 MB/s. 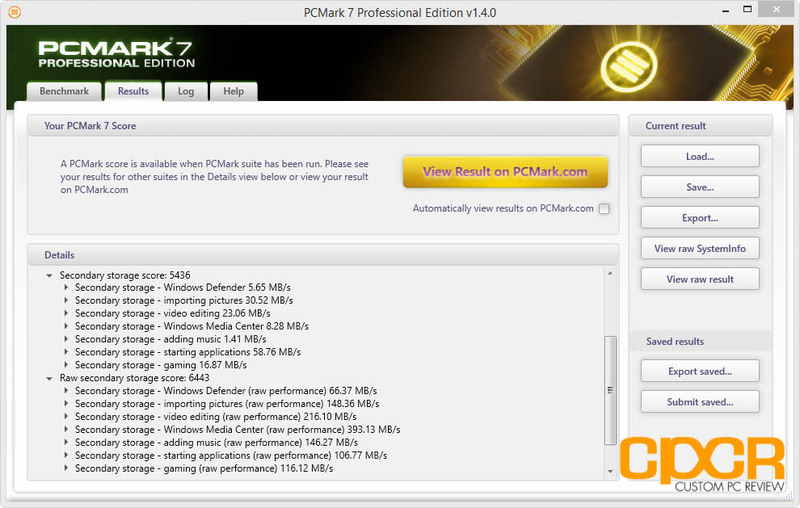 Again, we can see excellent results with Crystal Disk Mark that’s very representative of an enthusiast product. Looking at PC Mark 7, the results aren’t too encouraging. 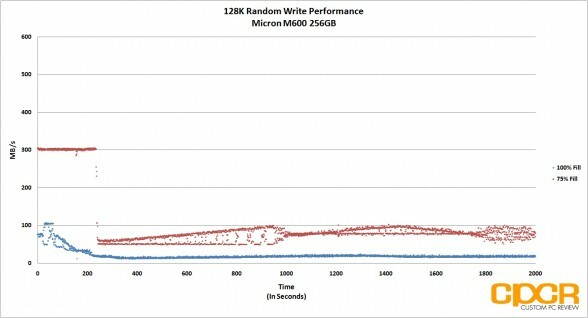 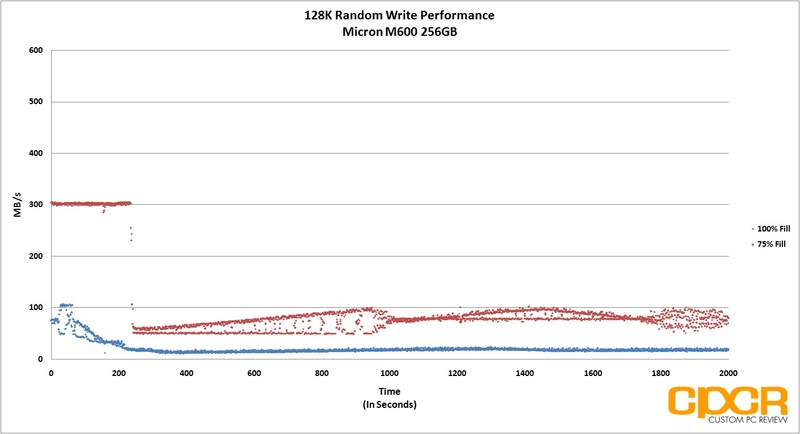 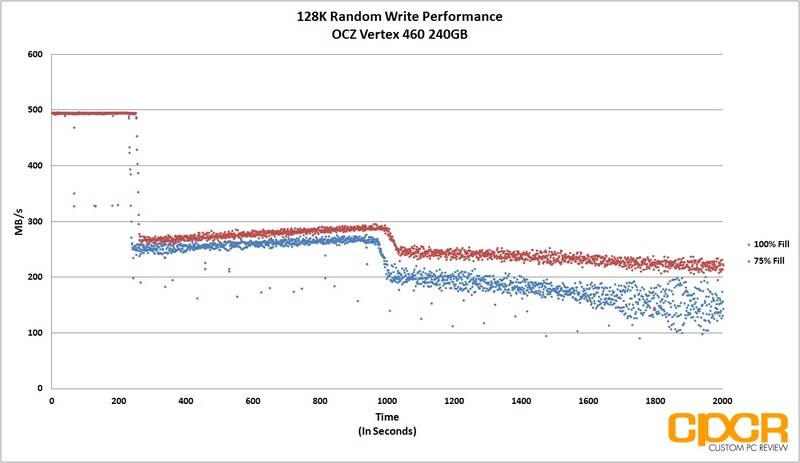 Our 480GB sample of the Vector 180 was beaten by the original 256GB OCZ Vector which was released several years back. 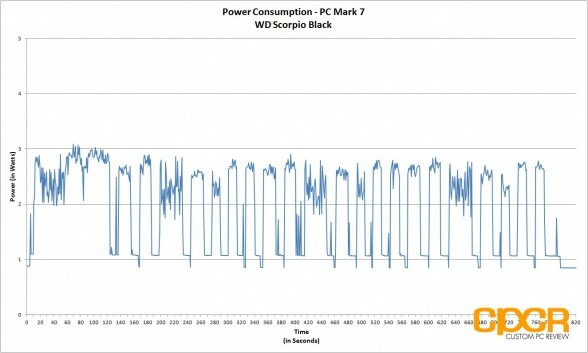 The Vector series drives have always been focused on sustained performance rather than bursty performance, so this is a bit expected. 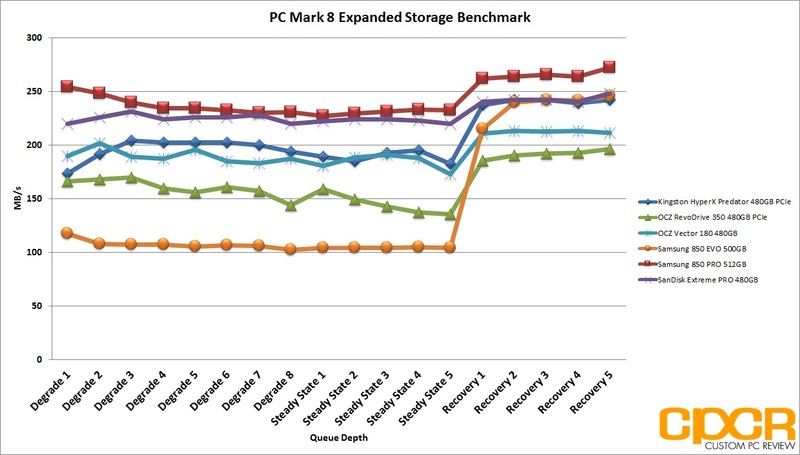 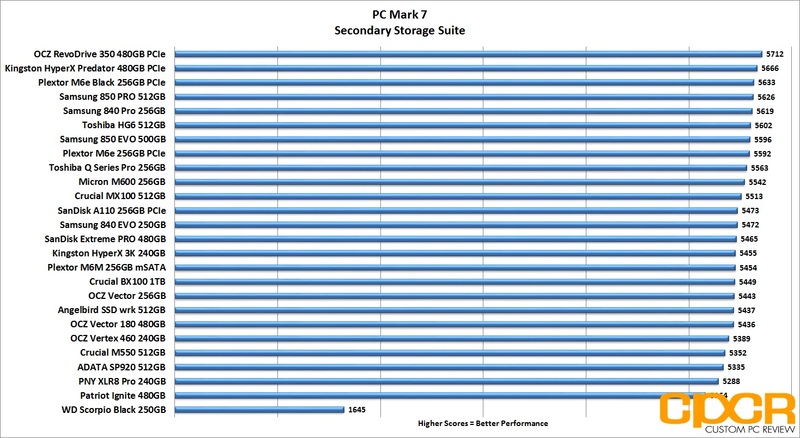 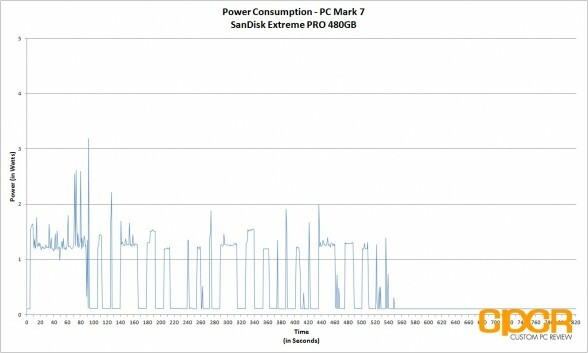 PC Mark 8’s Extended Performance benchmark is really where the OCZ Vector 180 shines. Because its controller is designed for heavier workloads, the OCZ Vector 180 did pretty well, but is still beat by the SanDisk Extreme PRO and the Samsung 850 PRO. 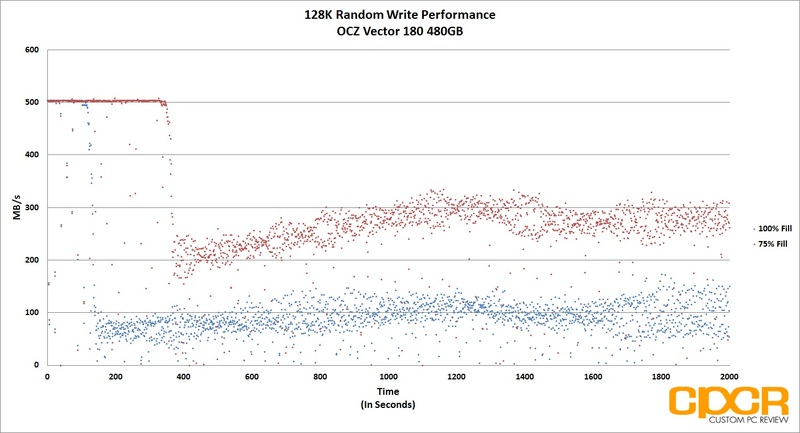 Fresh out of the box, performance on the OCZ Vector 180 is relatively competitive with 4K random read/write performance maxing out at 97,000/87,000 IOPS respectively. Mixed workload performance was decent as well with the drive capable of reaching 90,000 IOPS without issue. So far so good. 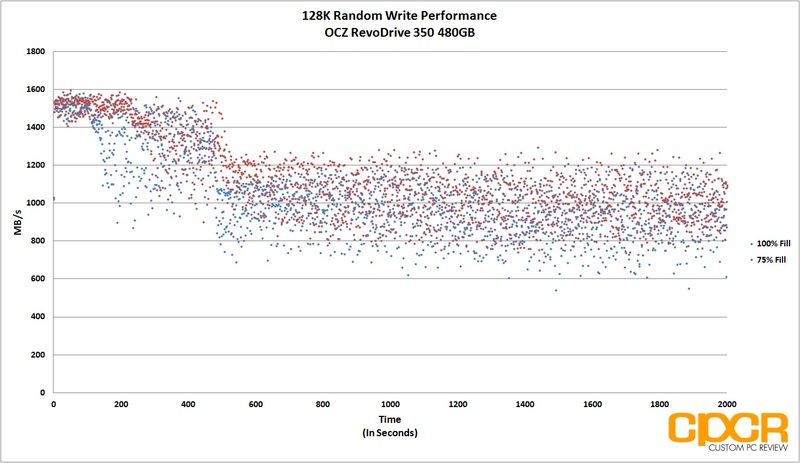 Generally what separates the enthusiast drives from the mainstream drives is steady state performance and the OCZ Vector 180 does deliver on that front. 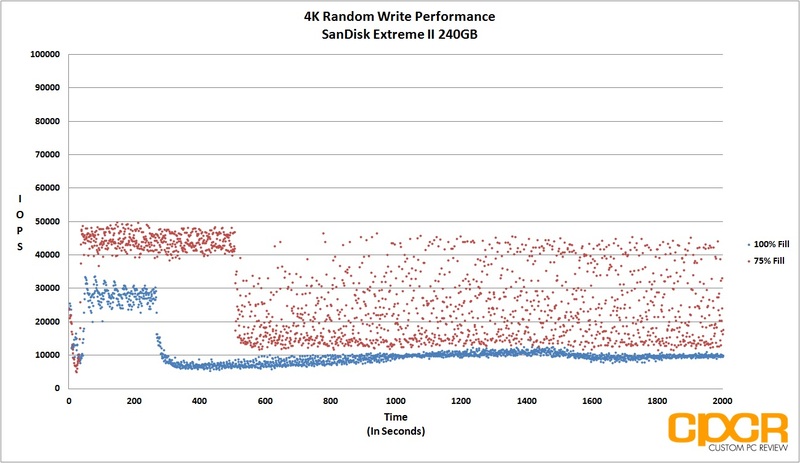 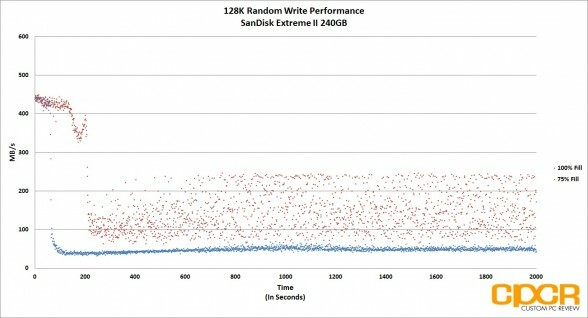 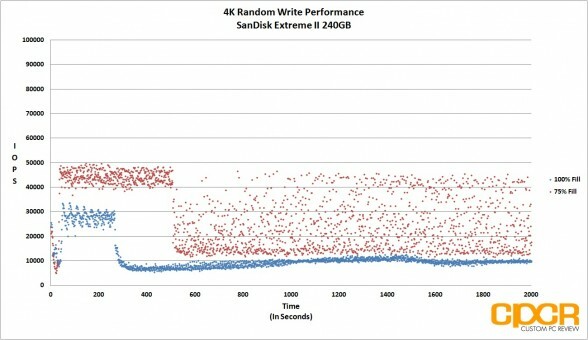 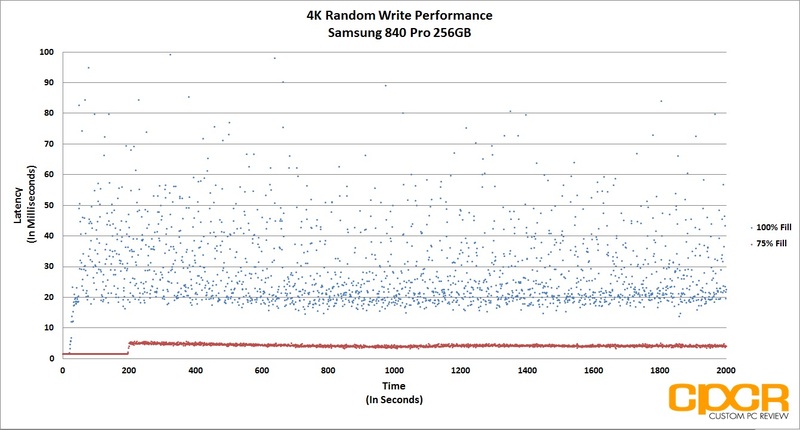 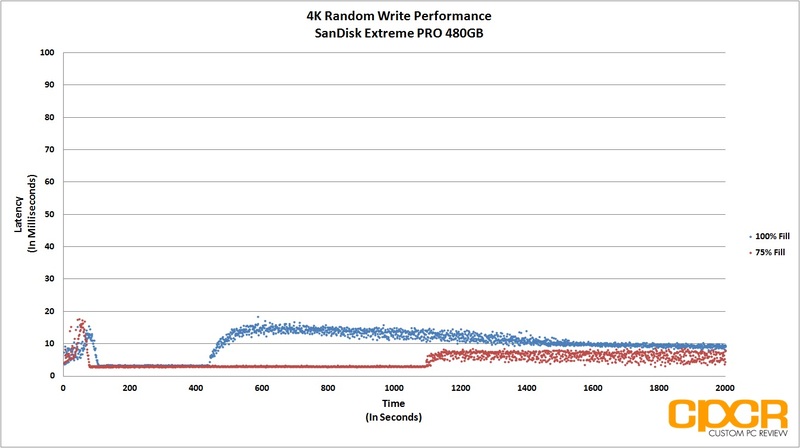 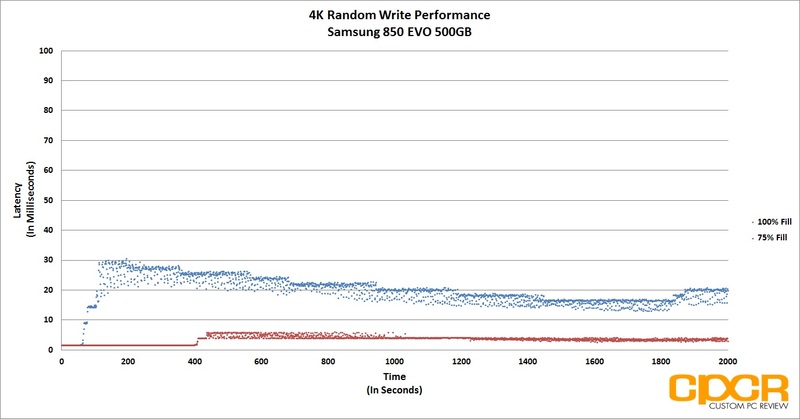 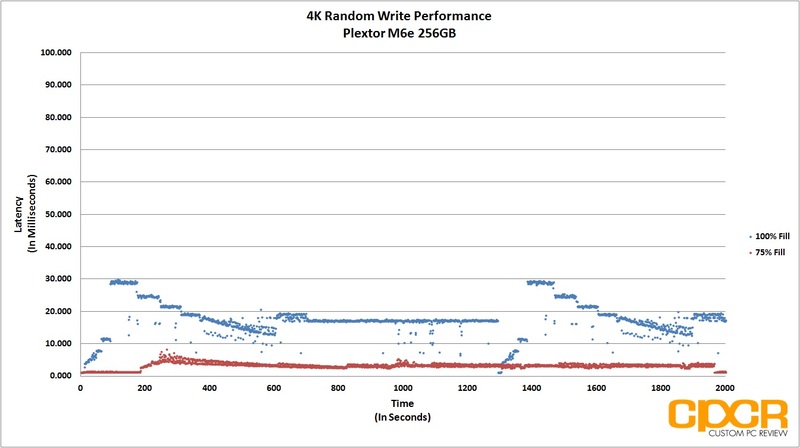 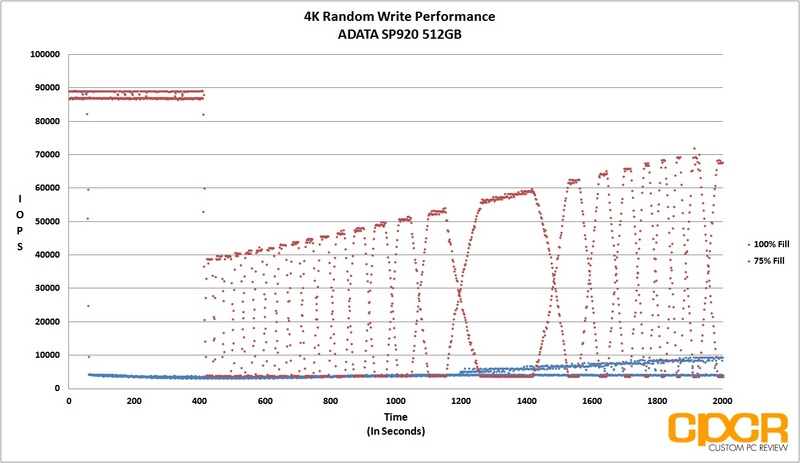 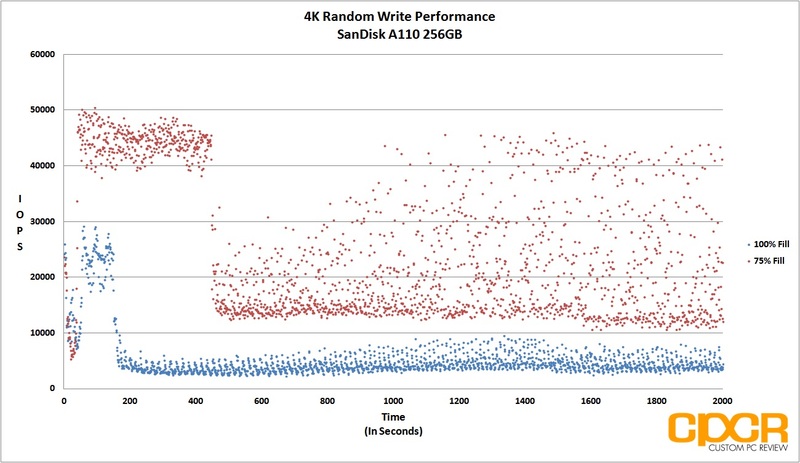 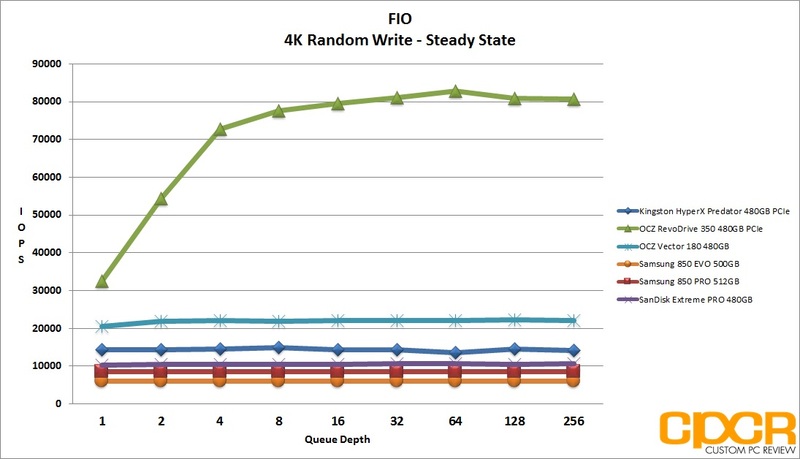 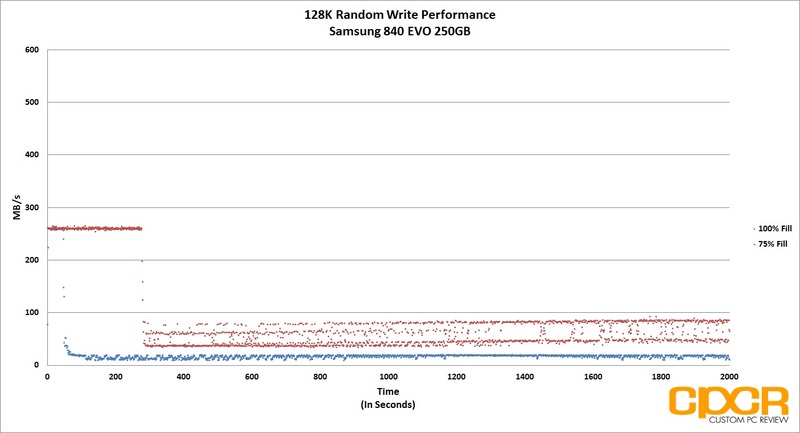 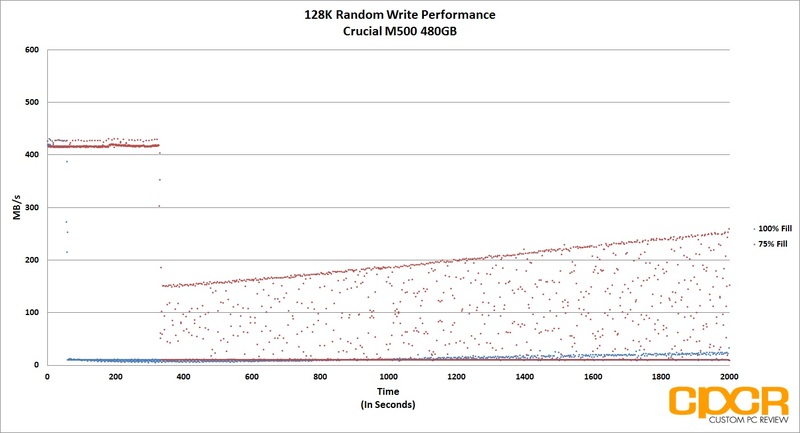 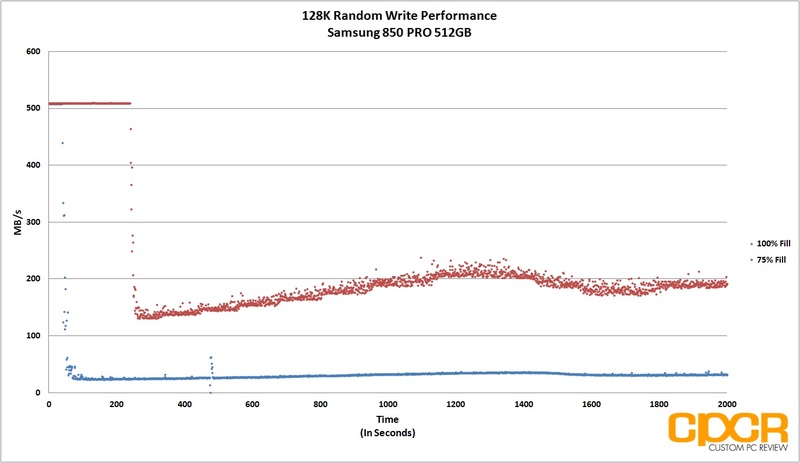 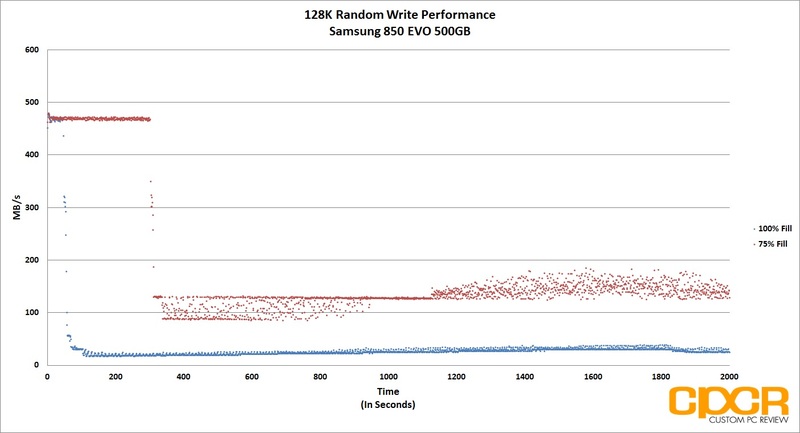 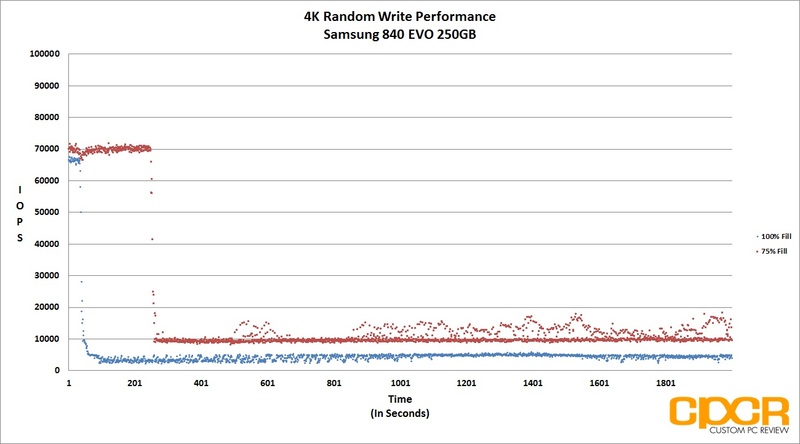 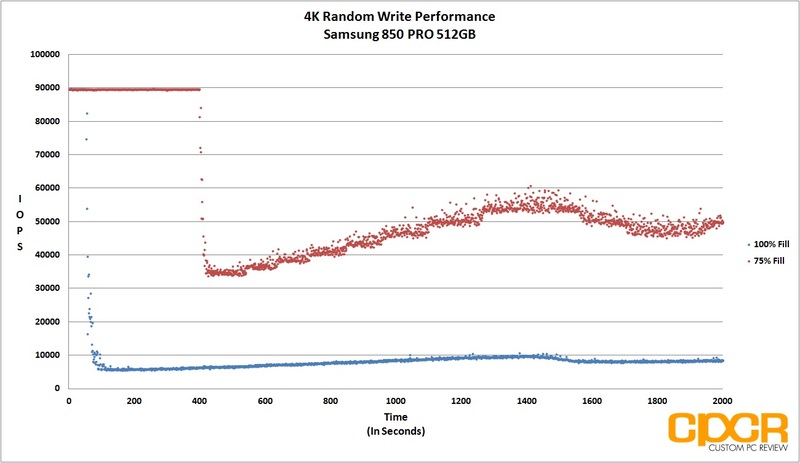 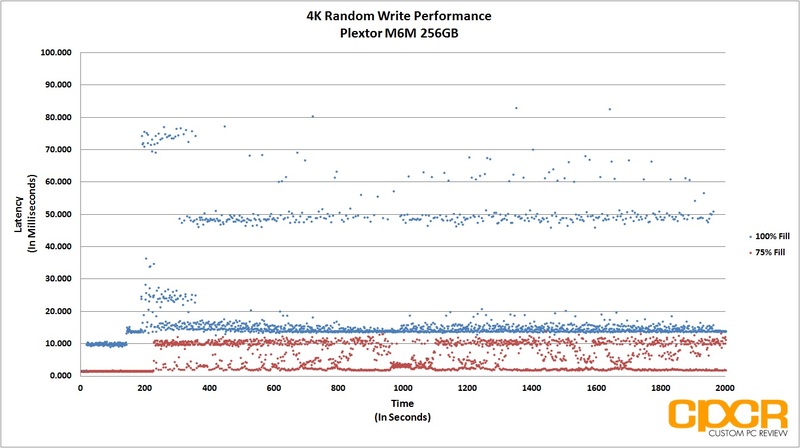 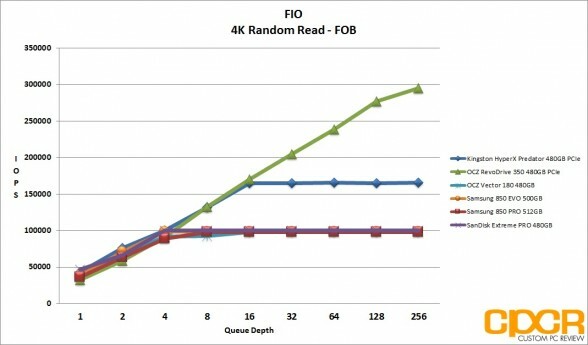 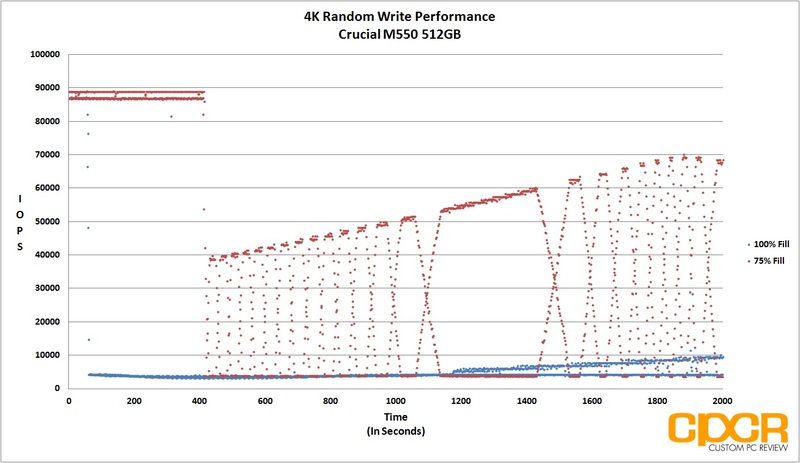 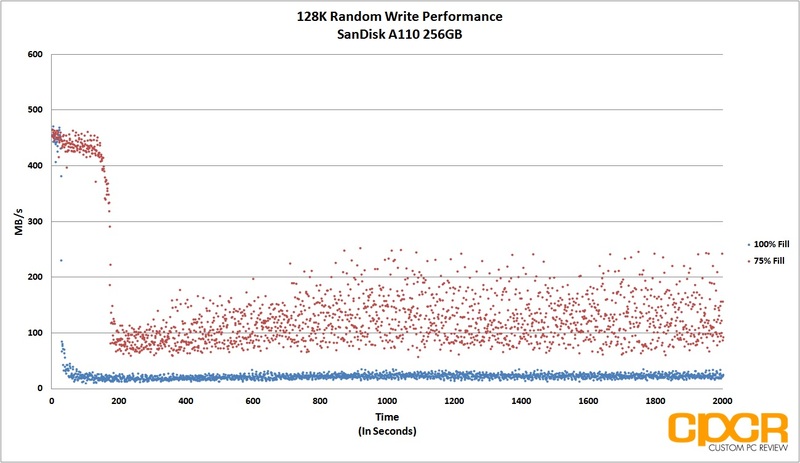 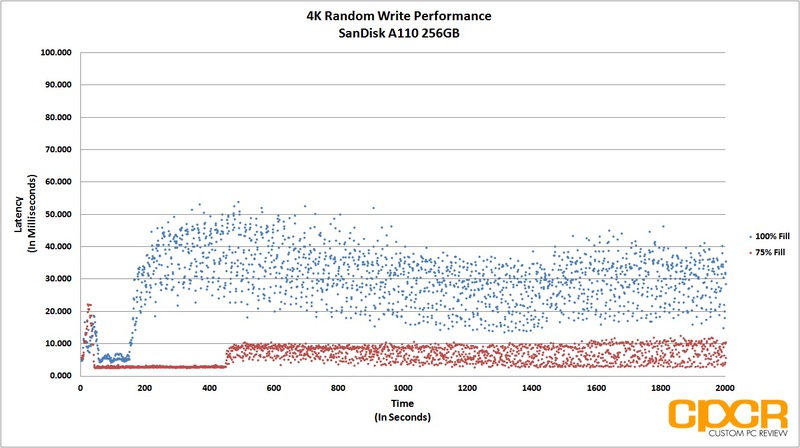 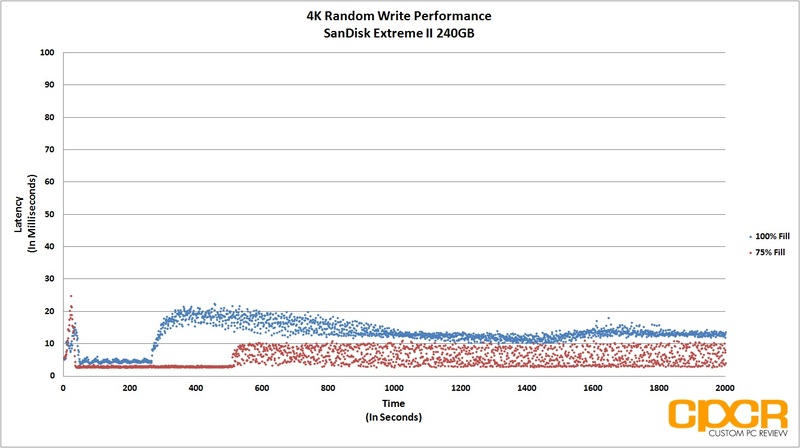 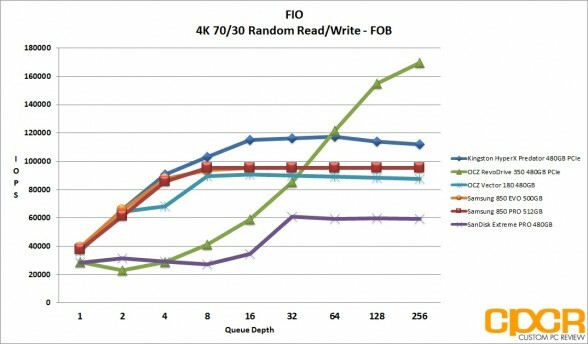 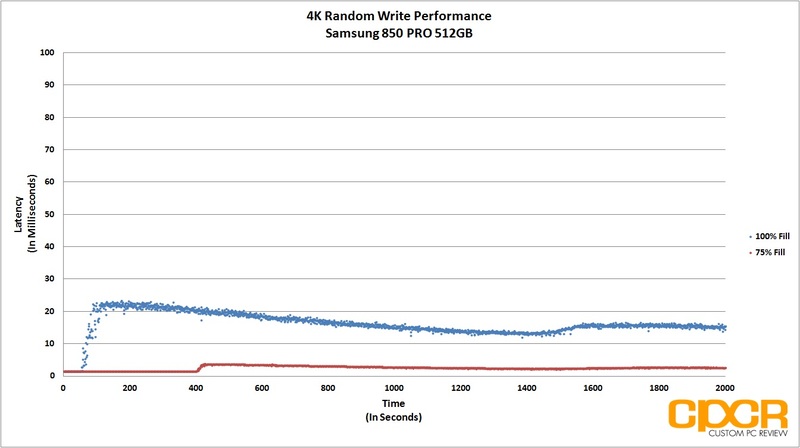 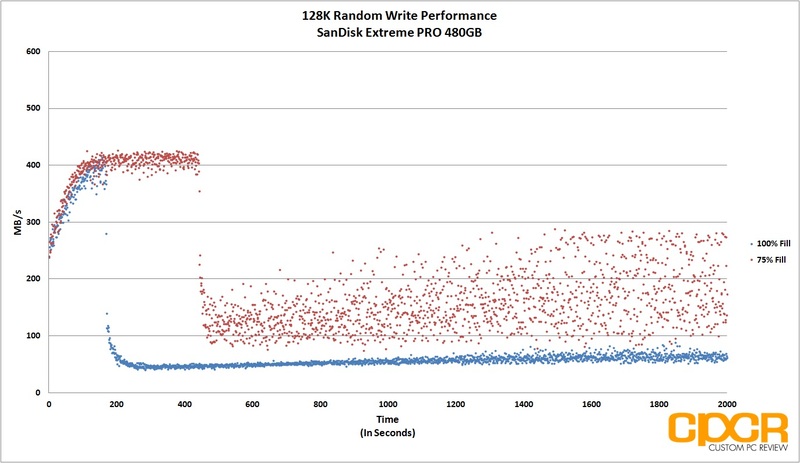 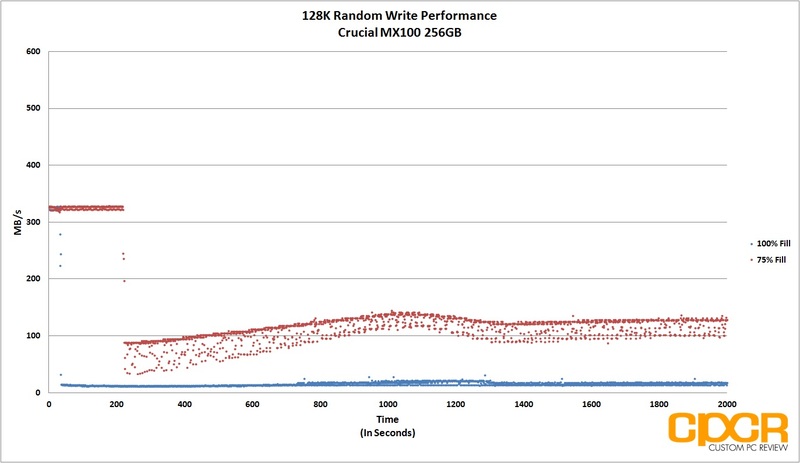 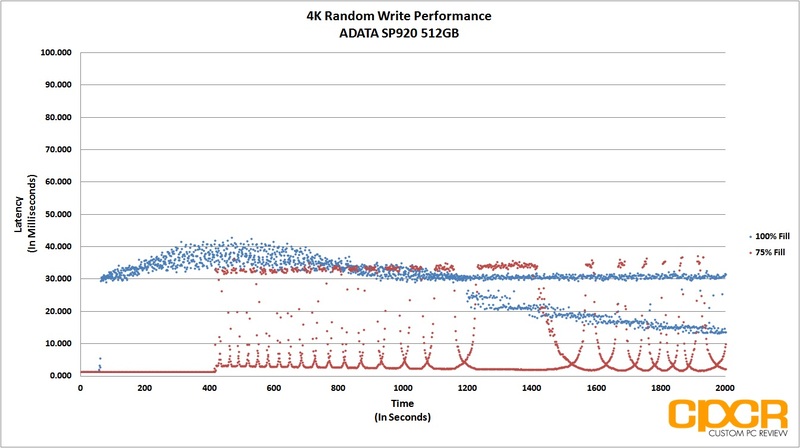 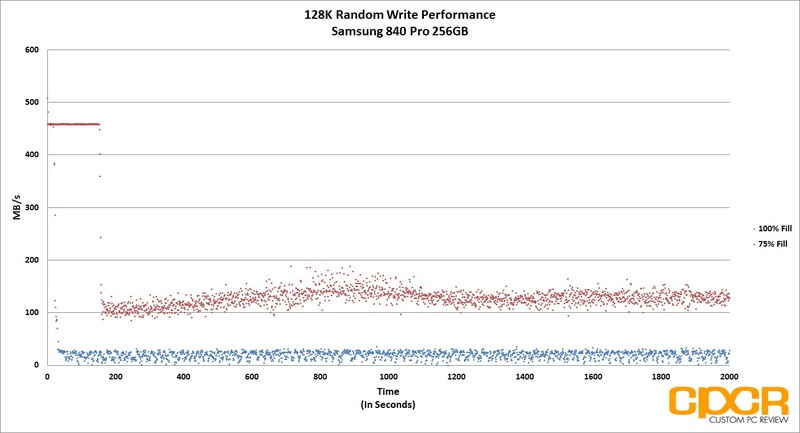 On 4K random reads, steady state performance was able to reach ~96,000 IOPS at QD32 and above although performance at lower queue depths is a bit lacking compared to competitors such as the SanDisk Extreme PRO and the Samsung 850 PRO. 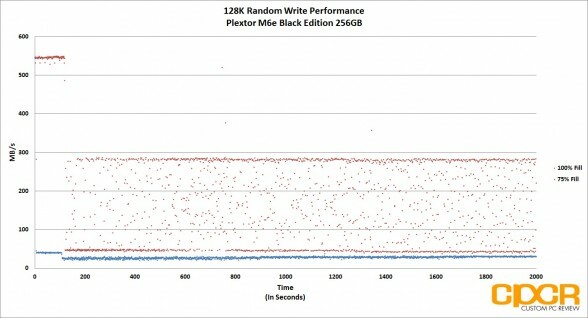 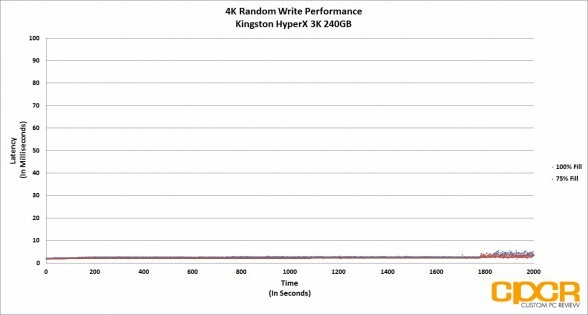 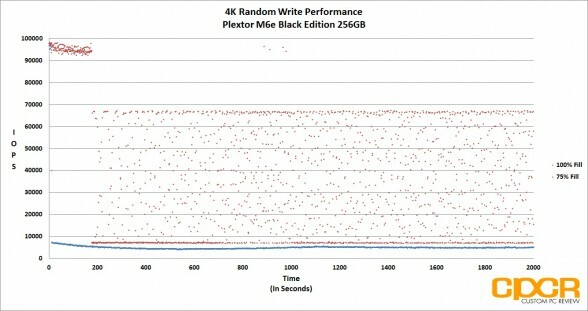 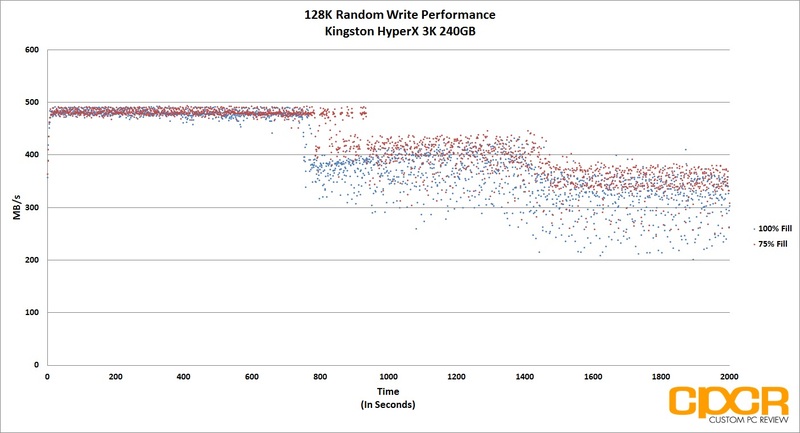 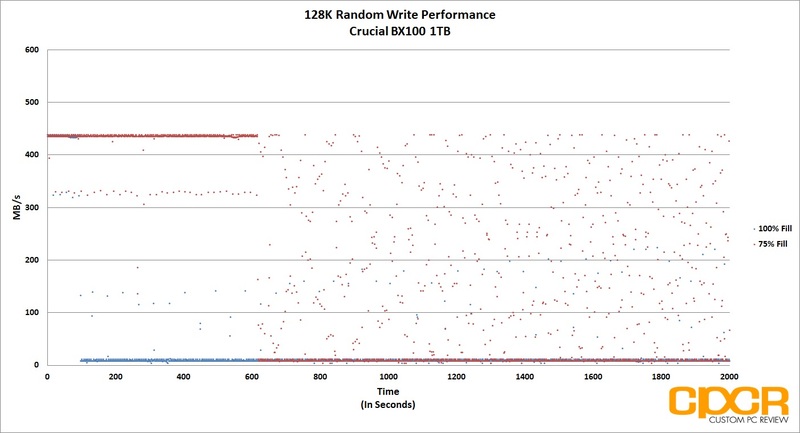 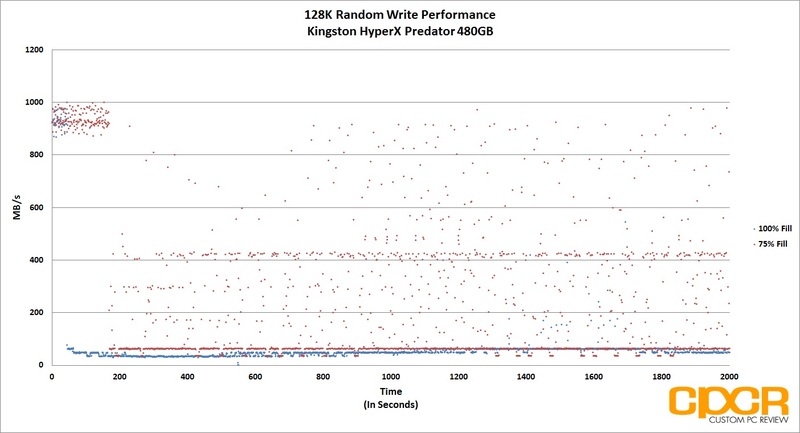 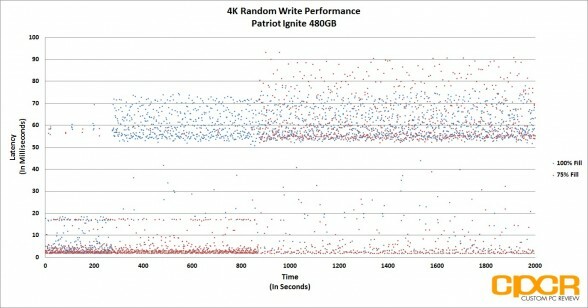 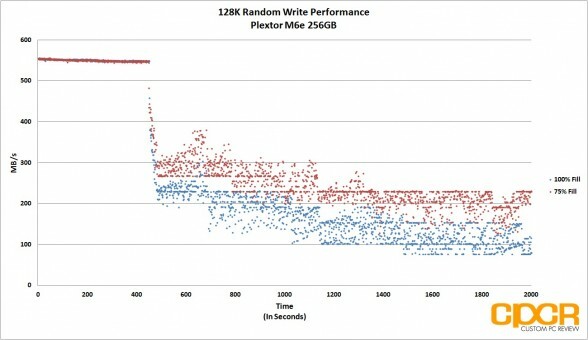 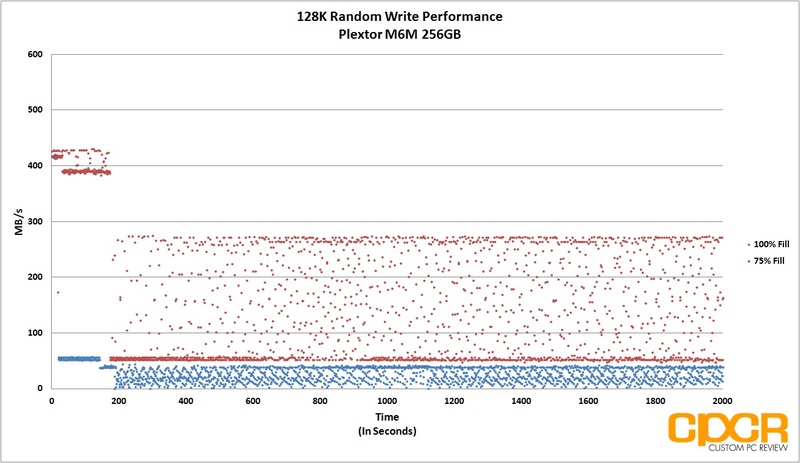 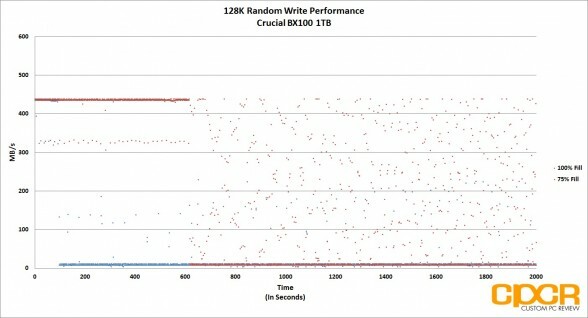 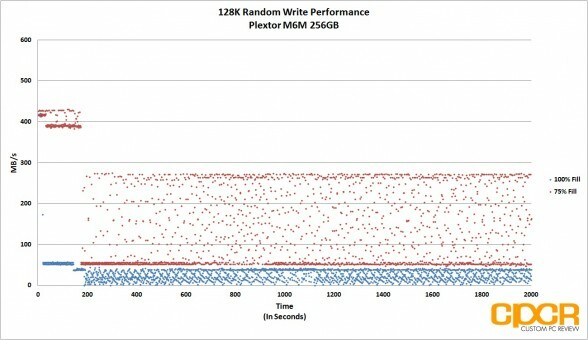 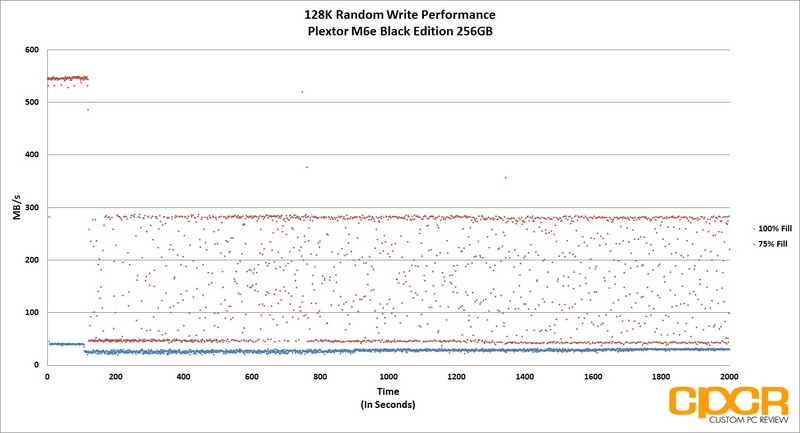 In 4K random writes, steady state performance was able to reach ~22,000 IOPS, beating its competitors at all queue depths. 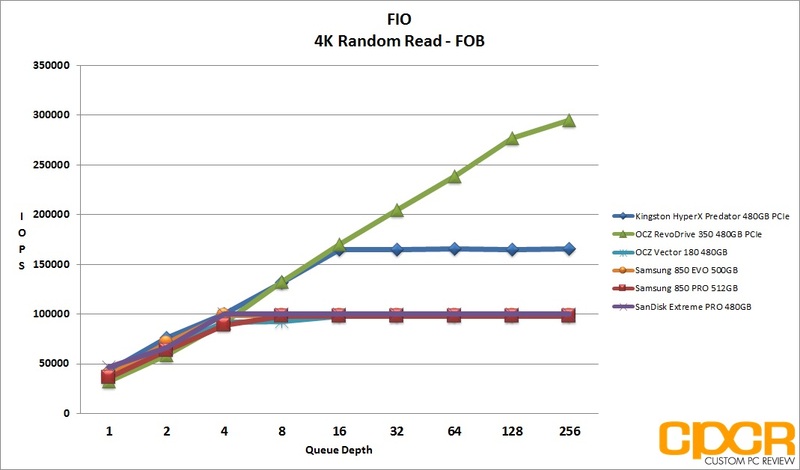 Mixed workload performance was similar to 4K random reads in that performance begins to ramp up significantly as higher queue depths are pushed. 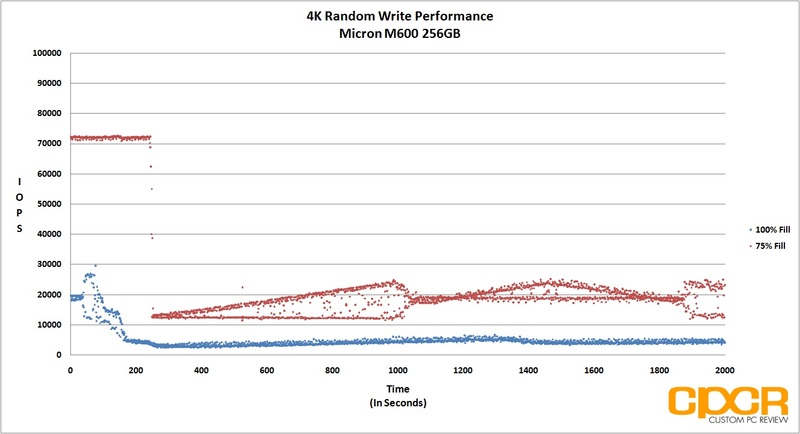 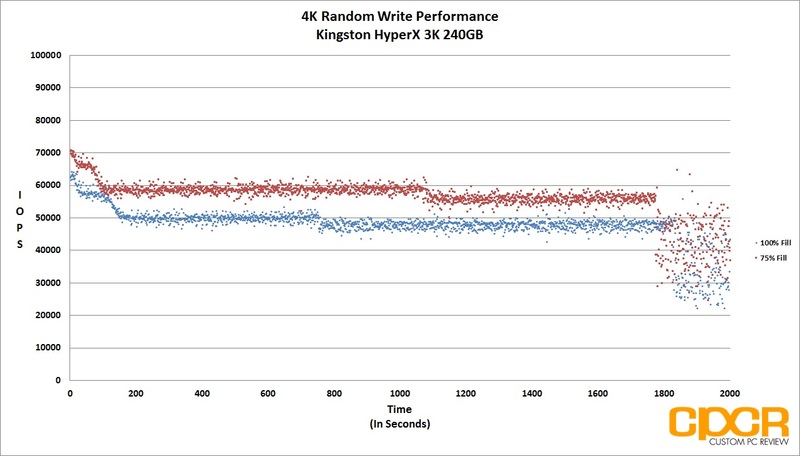 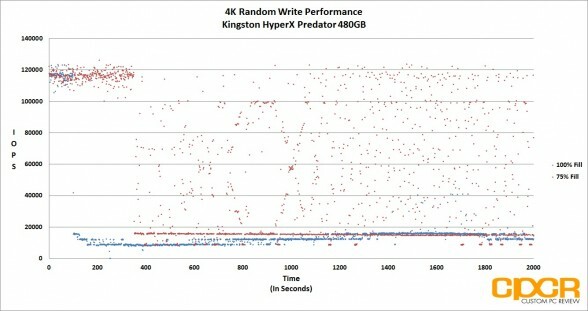 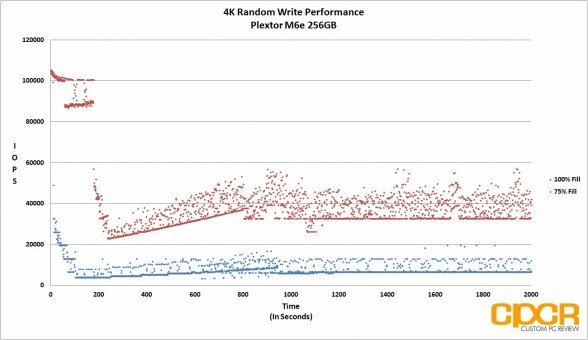 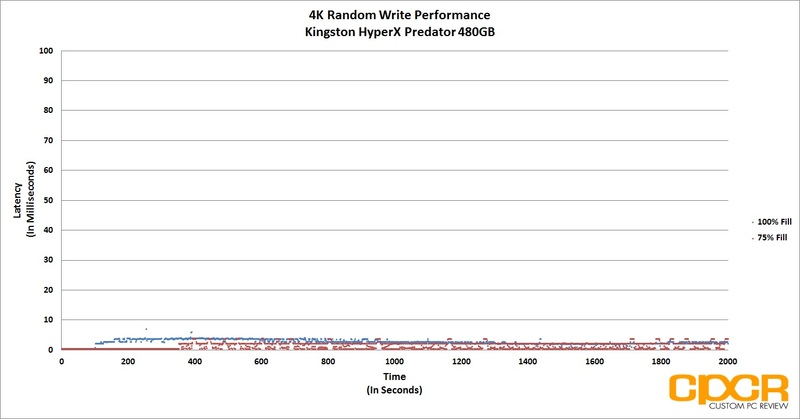 Looking at our 4k random write performance consistency results here, I’m actually quite disappointed with the Vector 180. 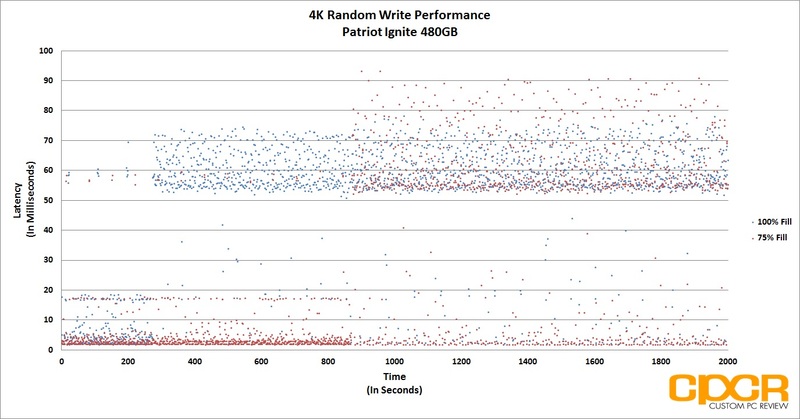 Not only is there very little consistency in 4k random write performance, it’s the first drive I’ve seen that will stall every ~22 or so seconds, dropping down to 0 IOPS. At 75% fill, the same thing happens, except stalling occurs around every 34 seconds or so. Latency at 100% fill isn’t as impressive as competing enthusiast drives, but OCZ does manage to keep it under 50ms so user experience shouldn’t be impacted too heavily. 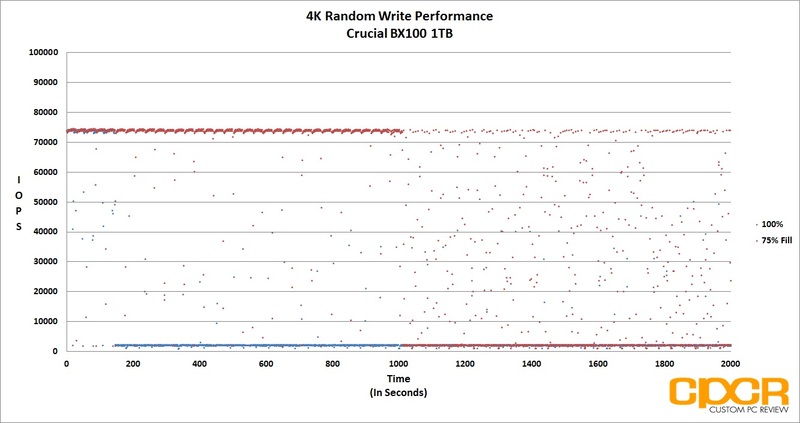 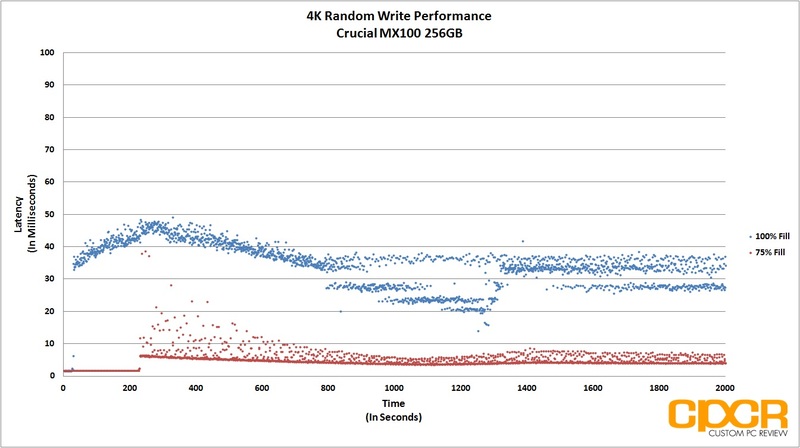 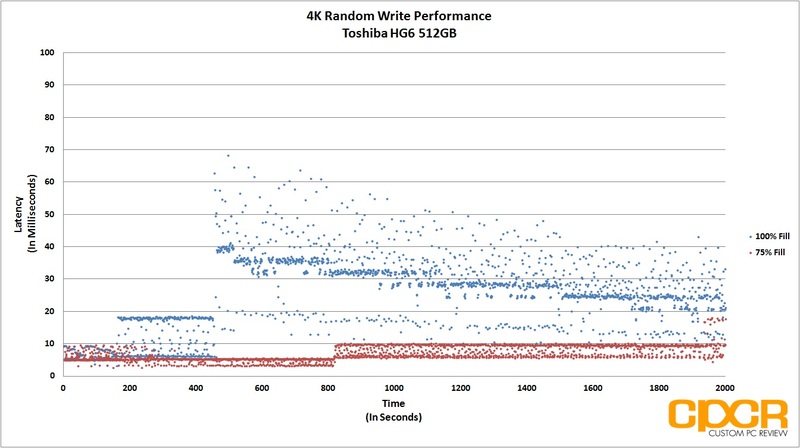 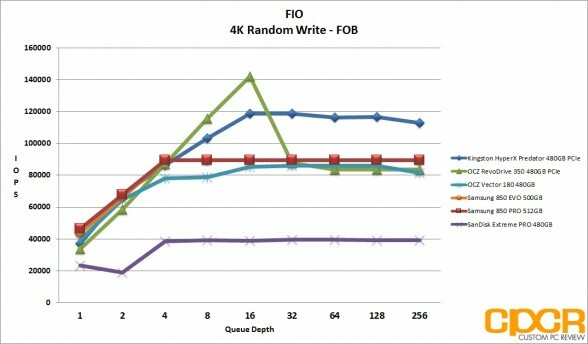 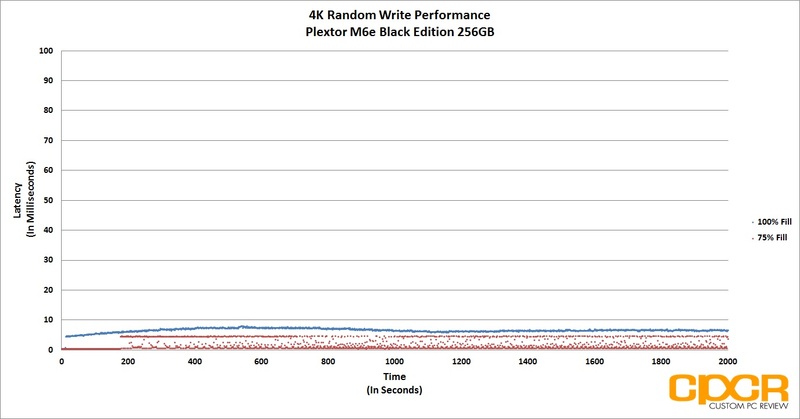 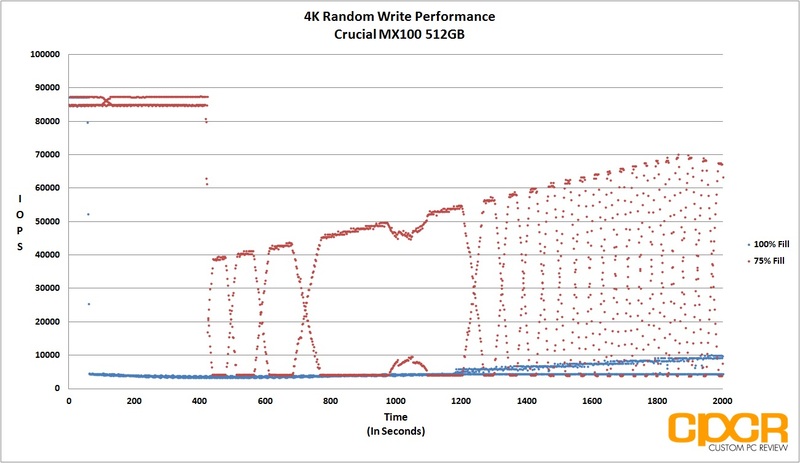 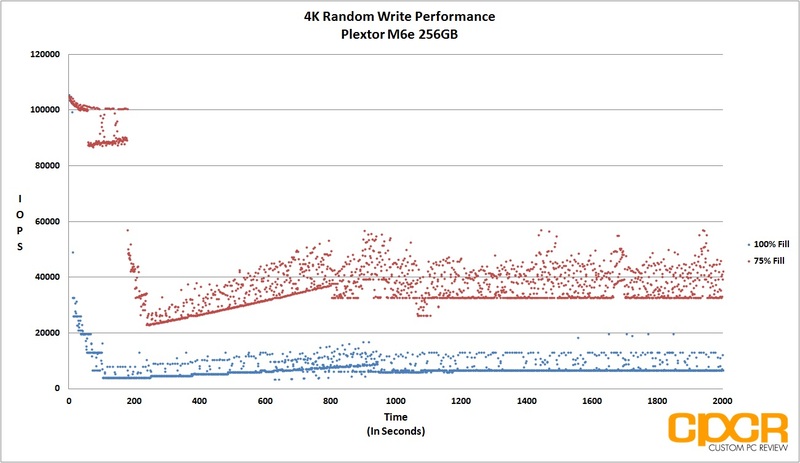 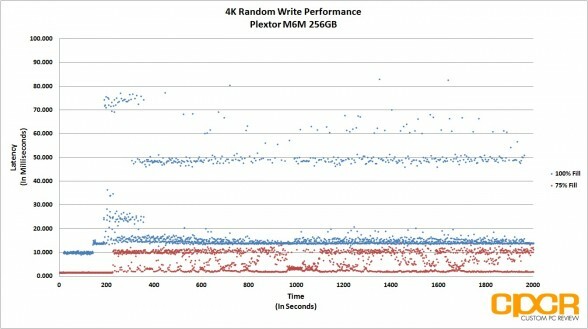 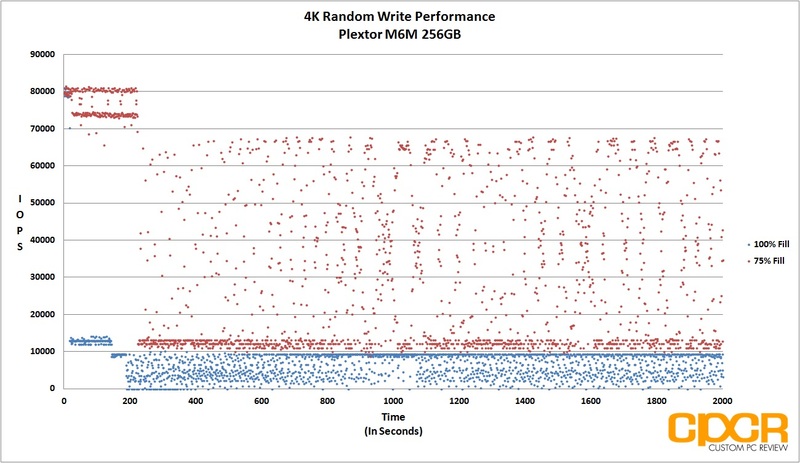 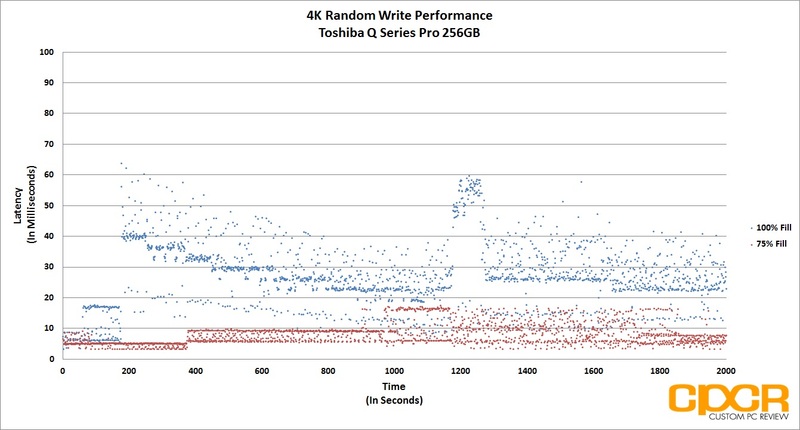 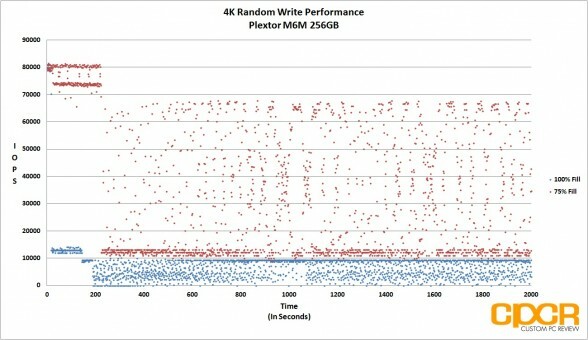 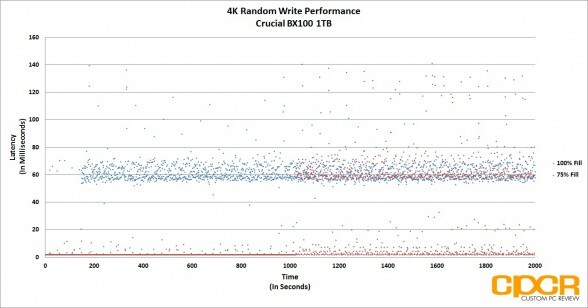 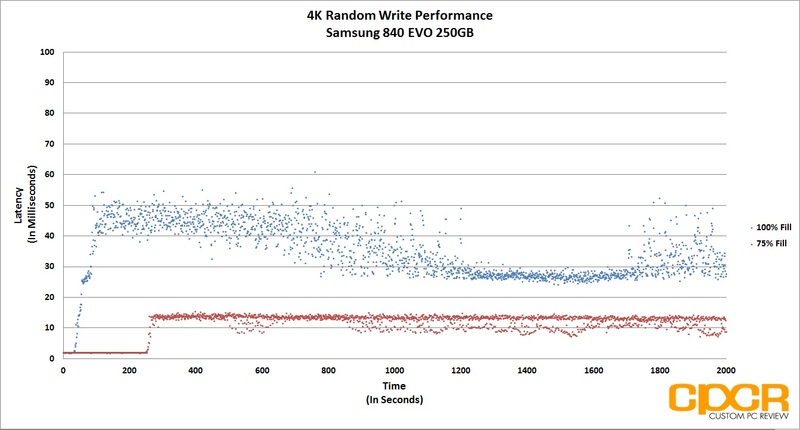 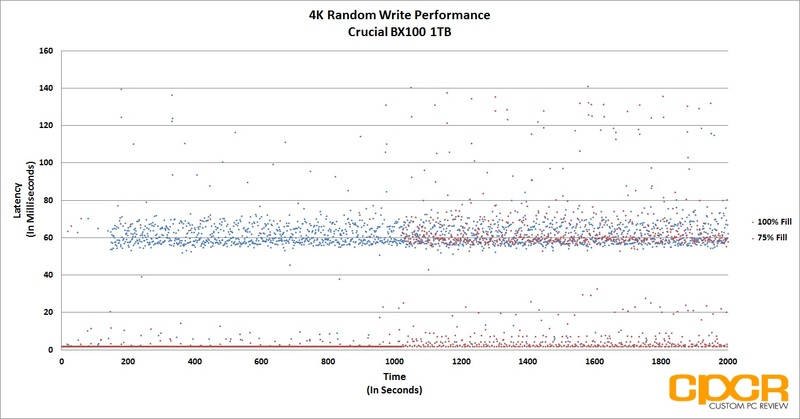 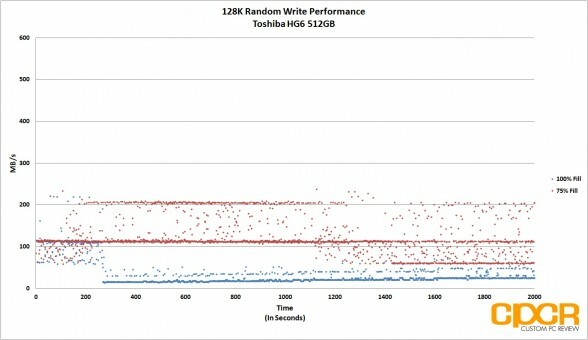 Similar to what we saw in the 4K random write consistency testing, 128K random writes are not only inconsistent, but performance stalls out from time to time as well although not as bad as what we’re seeing in 4K random writes. 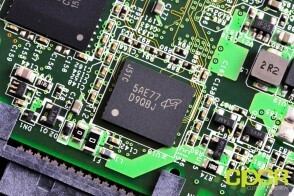 The Barefoot 3 controller has never really been one to support low power states and not much as changed with the Barefoot 3 in the OCZ Vector 180. 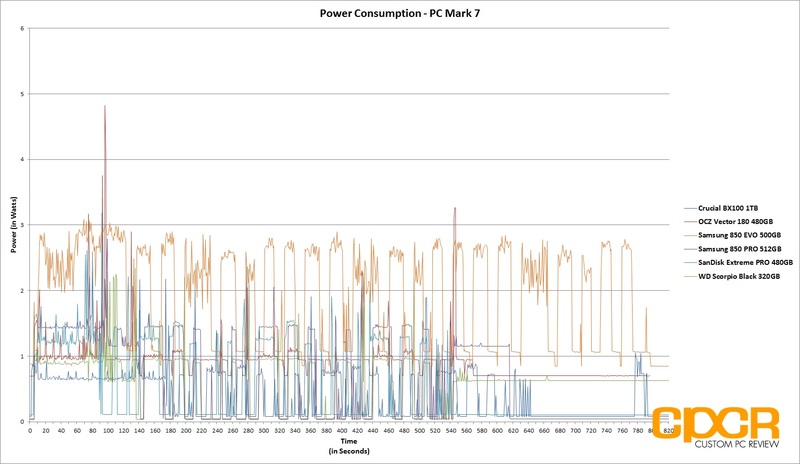 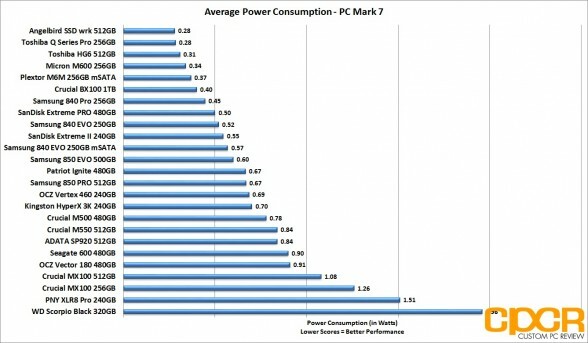 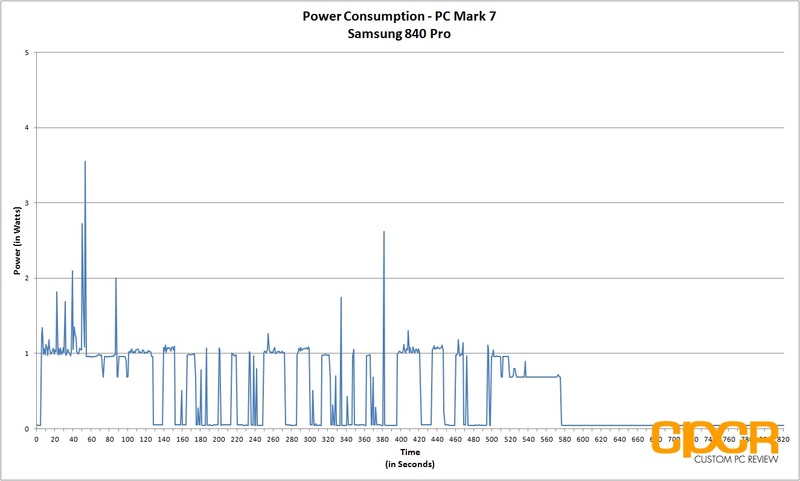 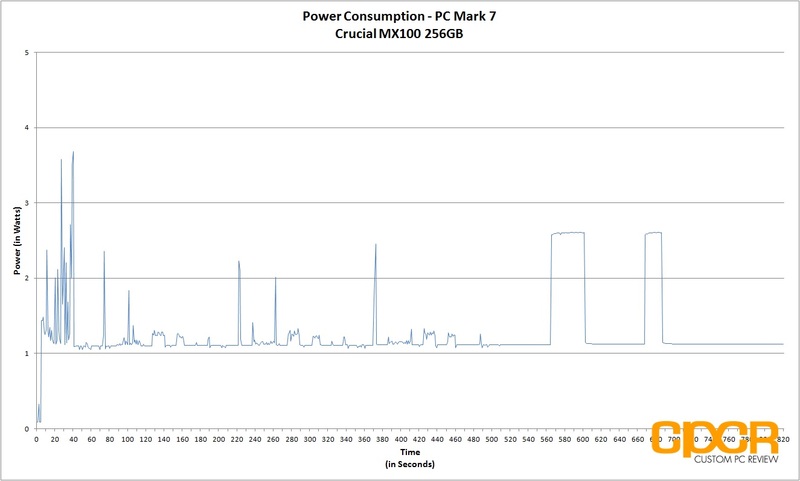 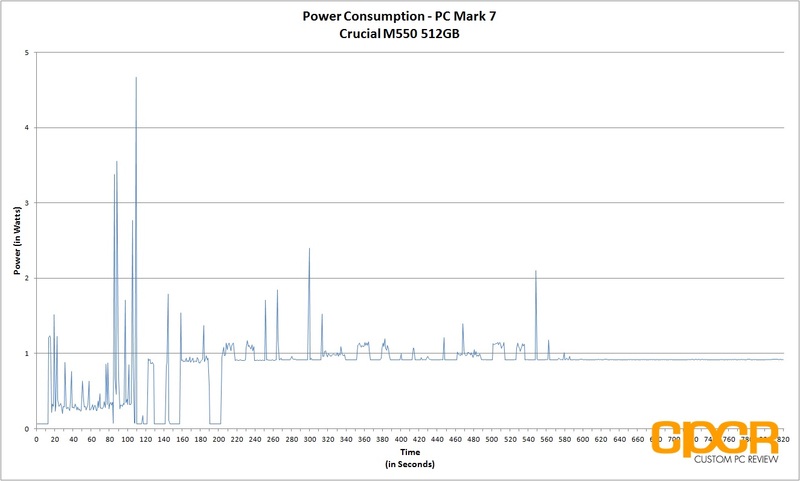 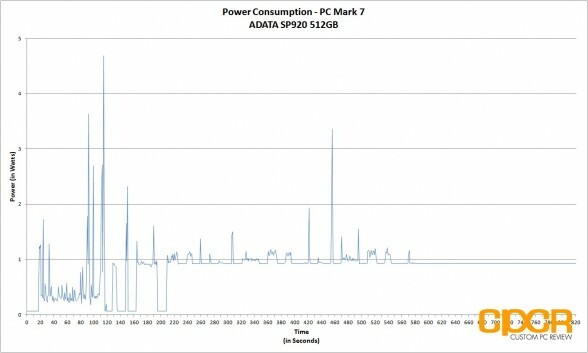 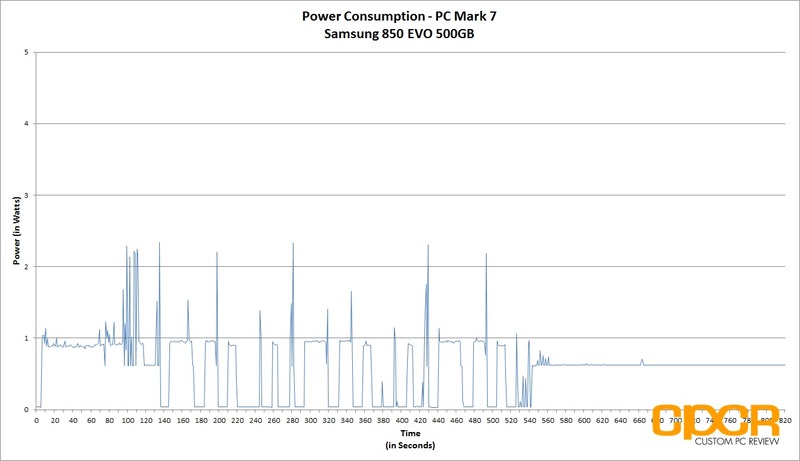 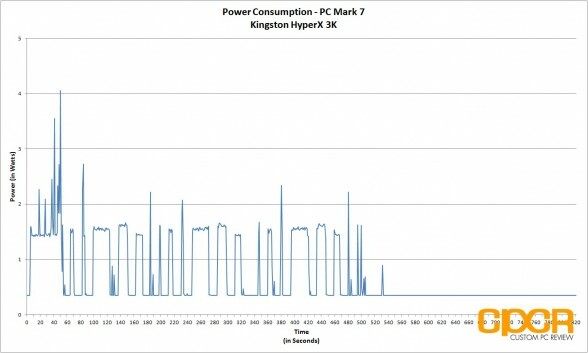 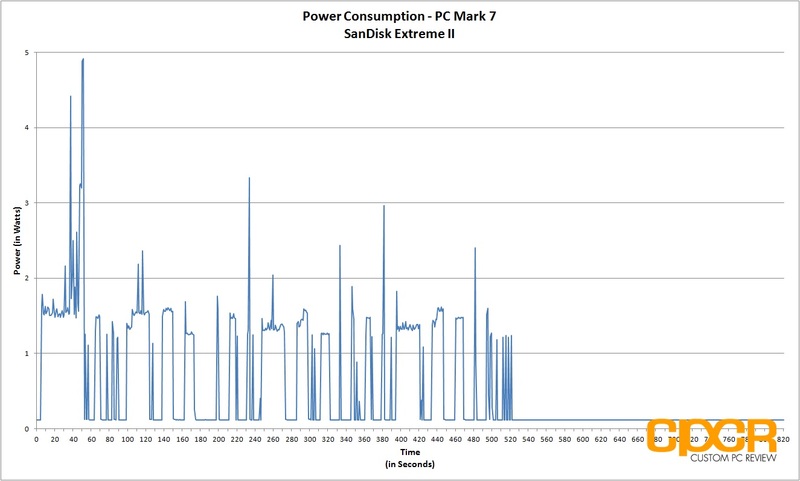 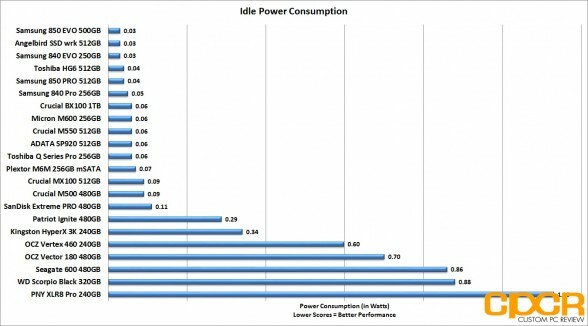 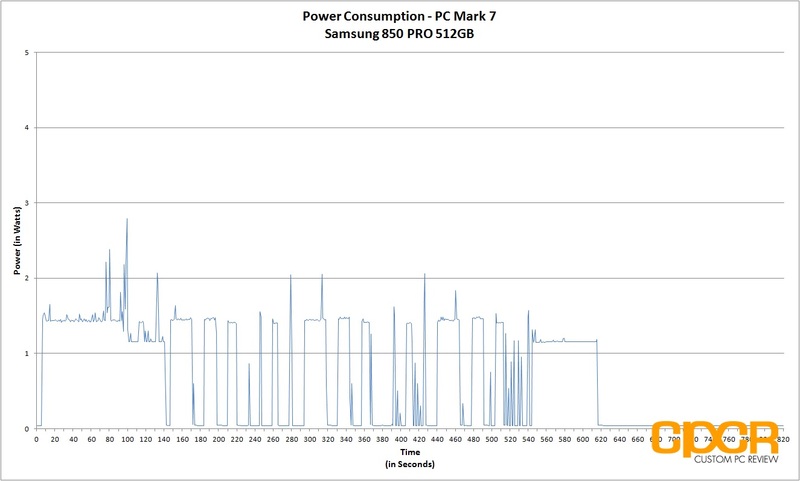 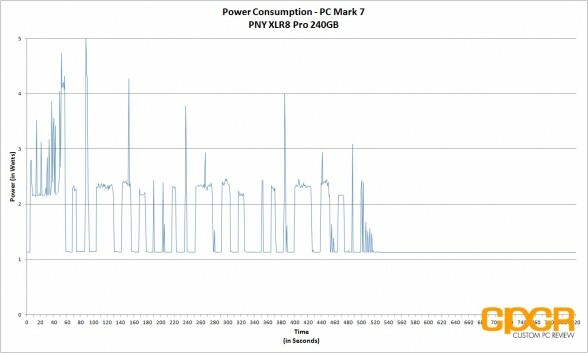 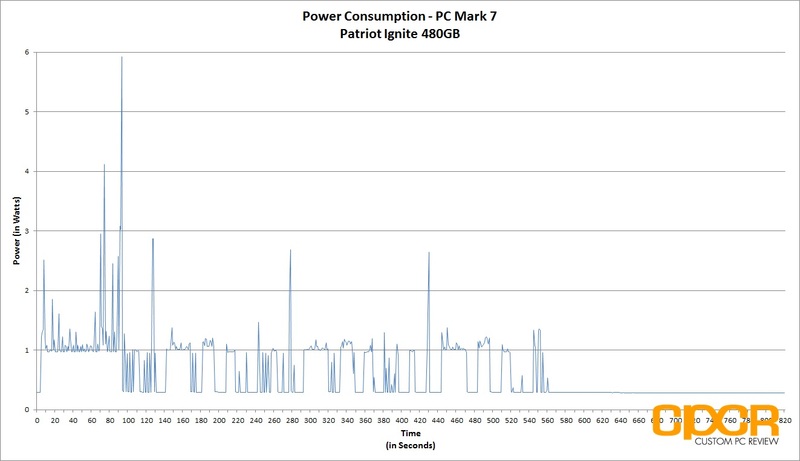 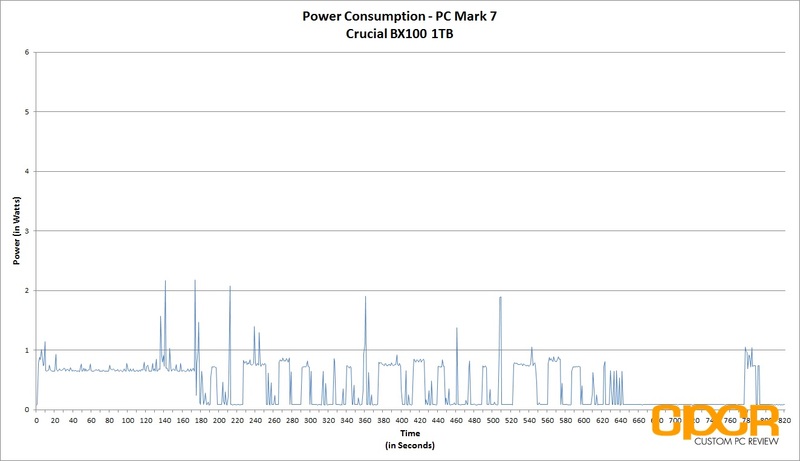 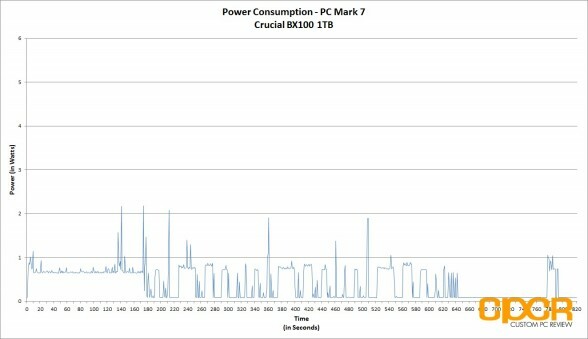 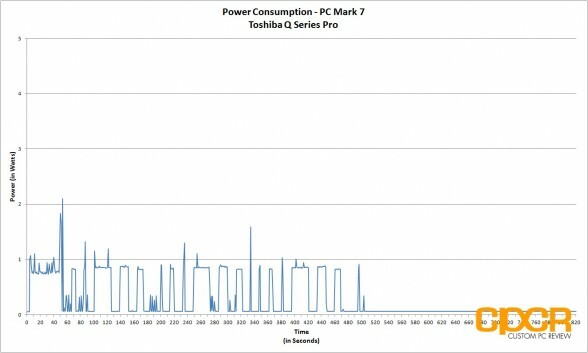 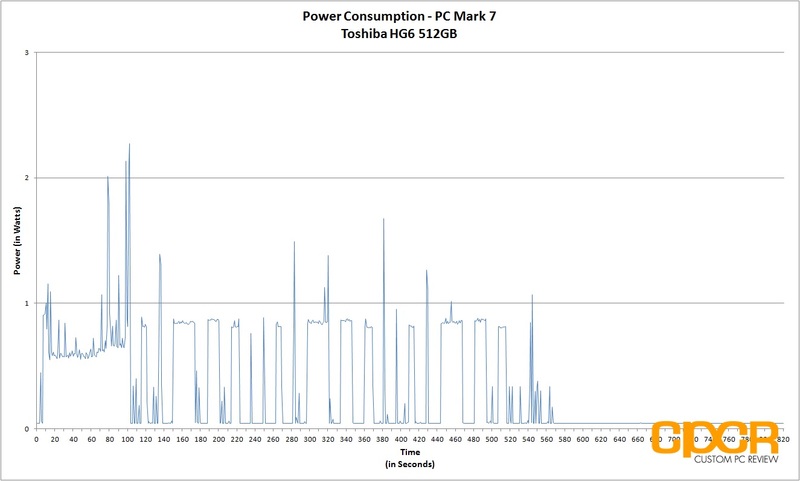 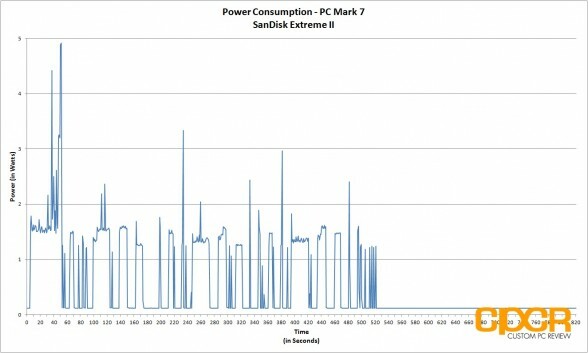 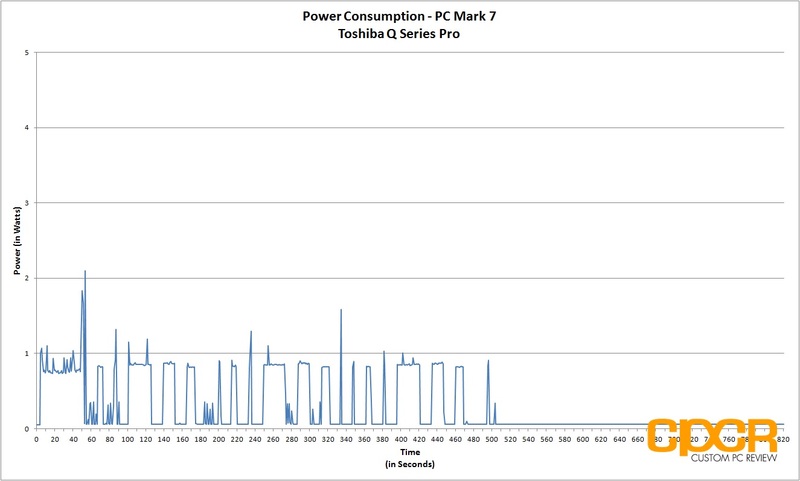 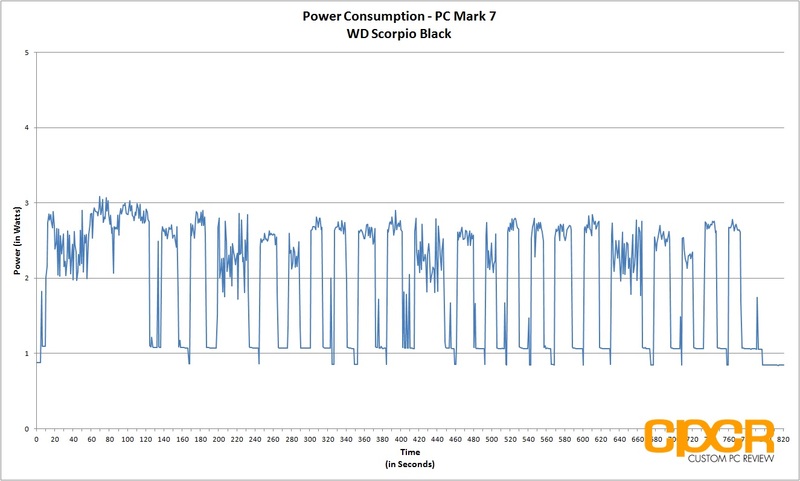 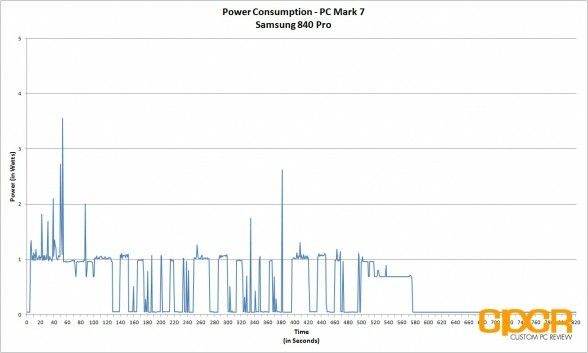 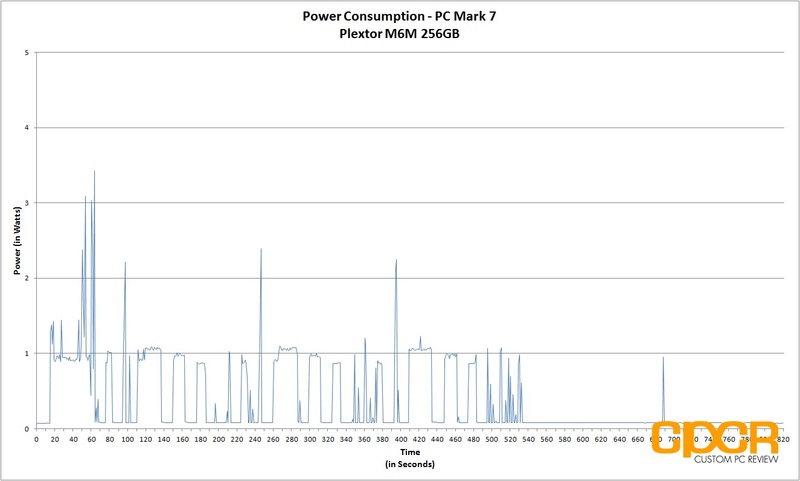 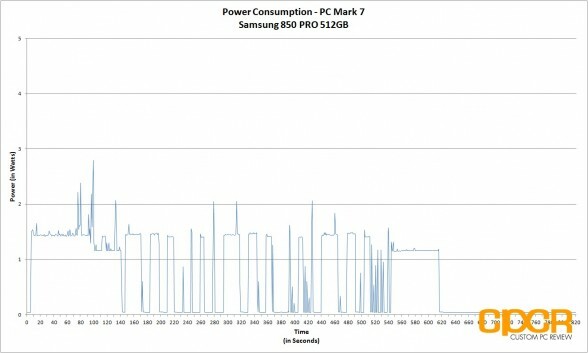 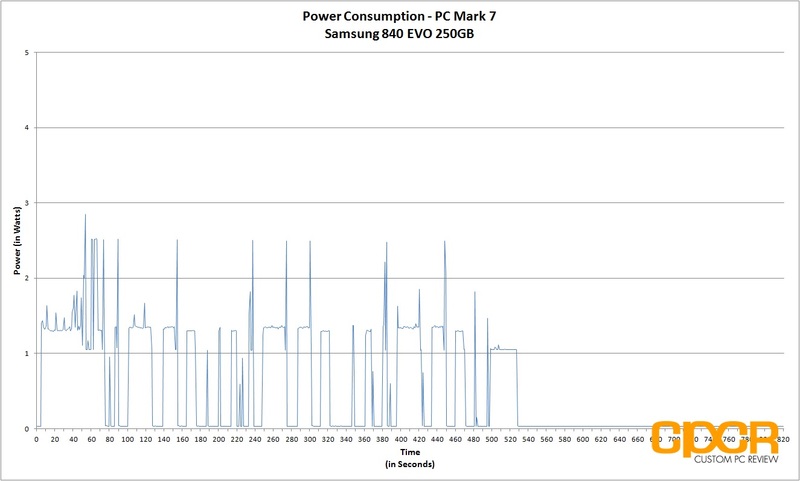 Idle power consumption sits relatively high at 0.70w and power consumption during our PC Mark 7 run averaged ~0.91w. 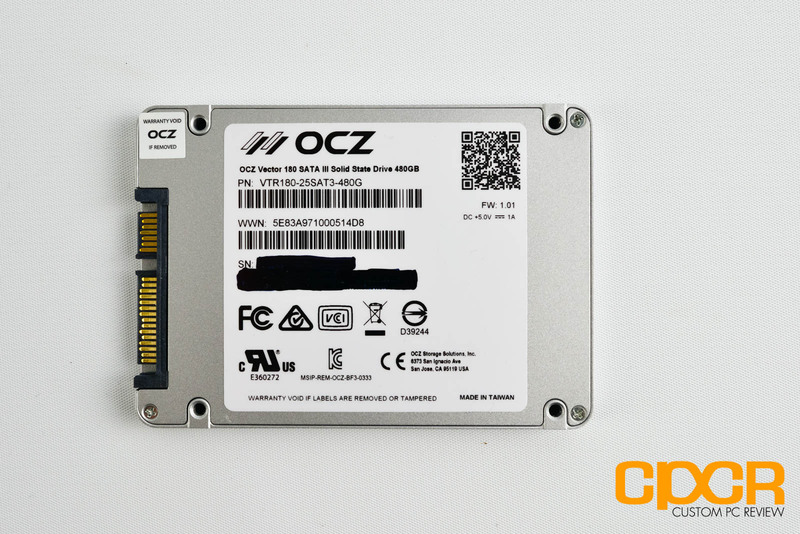 When OCZ first unveiled the Vector series, it was almost a make it or break it type of product that was designed to help keep the company afloat. After getting hit hard in the reputation department with the SandForce fiasco a couple years prior and executive mismanagement of the company, OCZ was trying hard to rebuild itself into its former glory as a leader of reliable, high performance SSD products. 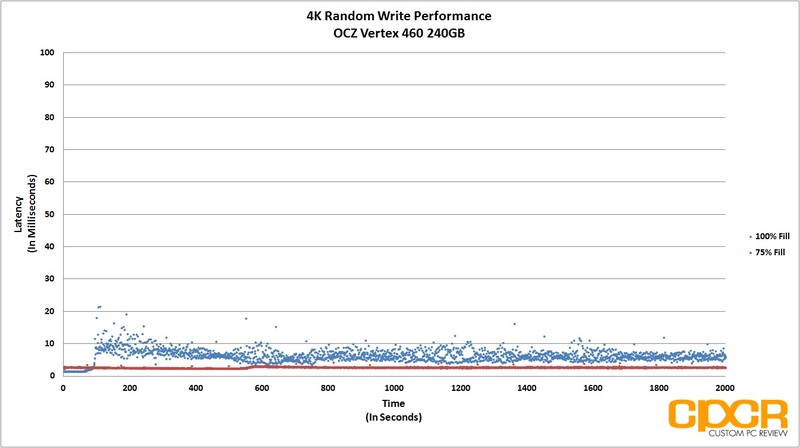 This gave rise to the OCZ Vector which would then be the first OCZ SSD to use their newly developed Indilinx Barefoot 3 controller. 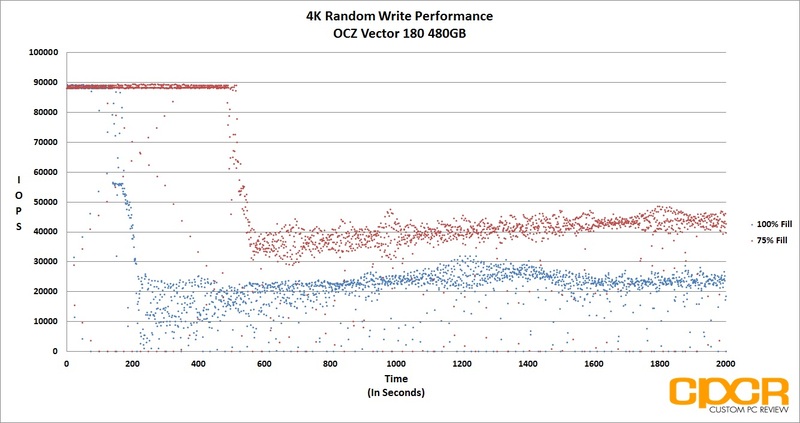 Several years later, we now have the OCZ Vector 180, which as you’ve seen in testing is unfortunately not much more than an evolution of the original product. 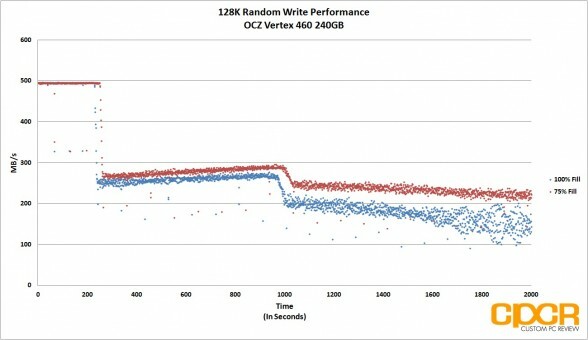 On one hand, I’m very happy to see that OCZ is making reliability such a big deal in the Vector 180. 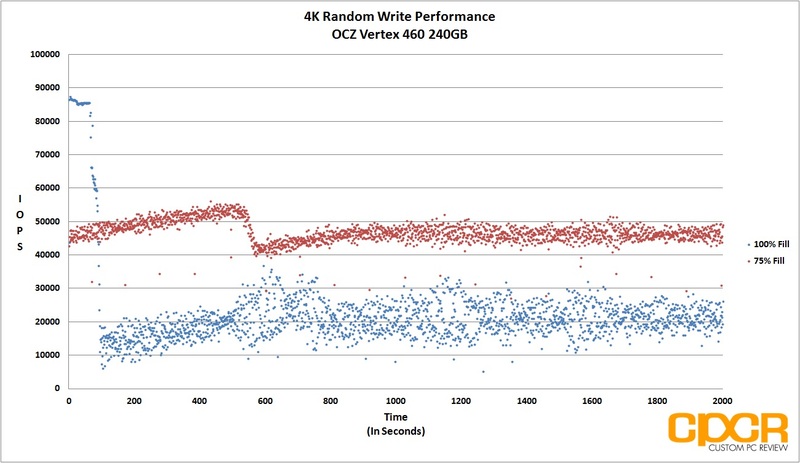 The original goal of the Vector series was not only high performance but also reliability as well and it’s nice to see that OCZ is reworking algorithms and putting in circuitry to mitigate any reliability concerns including sudden power loss. 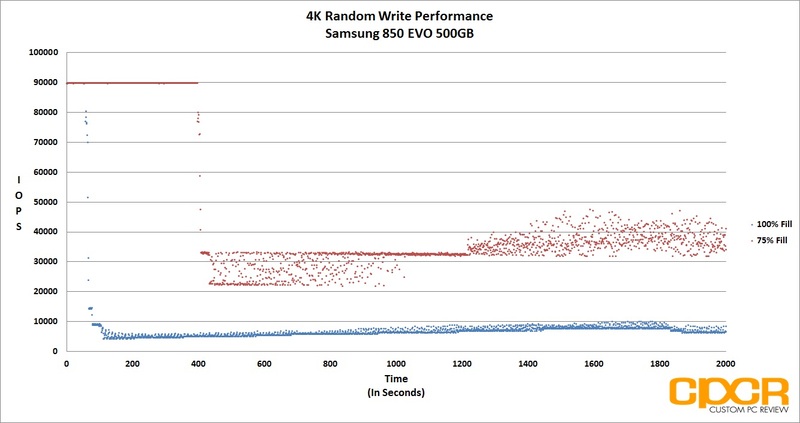 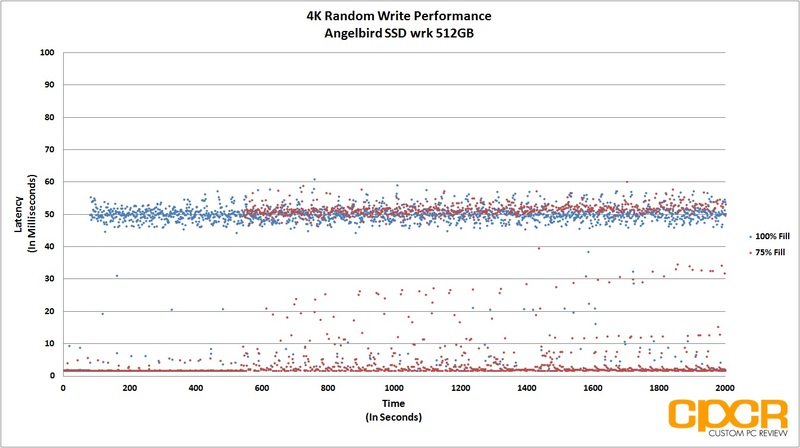 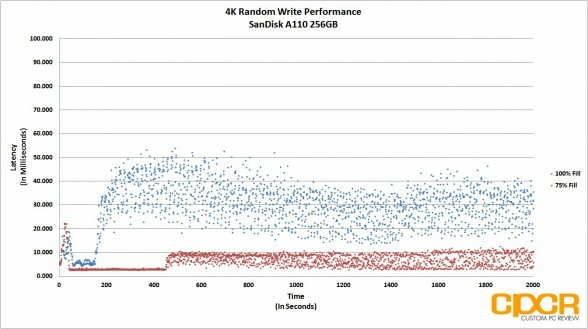 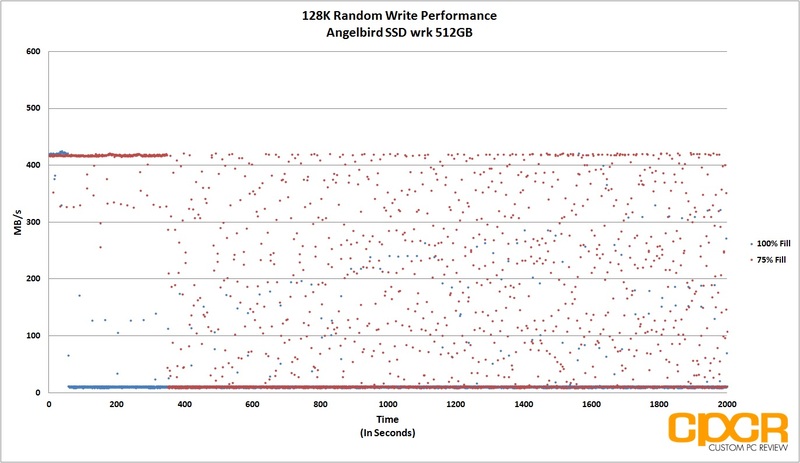 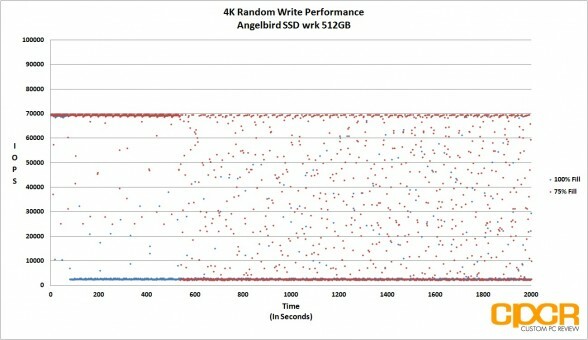 That being said, this type of performance consistency issue isn’t happening on competing performance SSDs so hopefully OCZ can rework their algorithms to ensure that performance stays consistent even as the drive is flushing the mapping tables. As for power consumption, the Barefoot 3 controller still lacks the capability of running at low power states, so power consumption on the OCZ Vector 180 is still among the worst on the market. 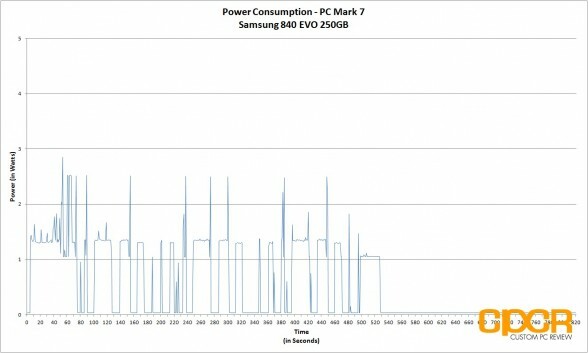 Those looking for a SSD for mobile use should definitely take a look at drives powered by Samsung, SMI or Marvell. 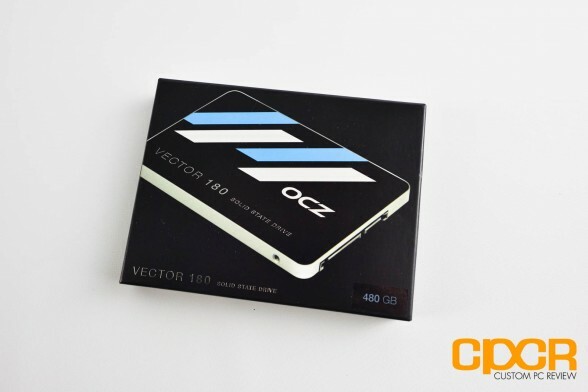 Currently, the OCZ Vector 180 480GB can be found at various online retailers for $269.99, which is approximately $0.56/GB. 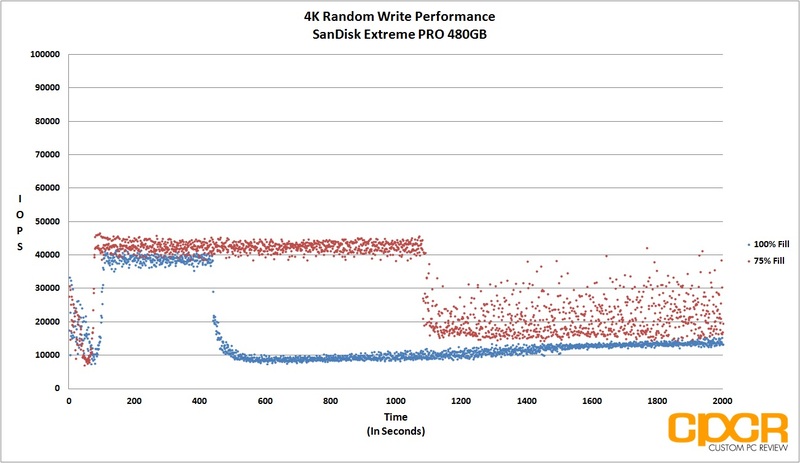 This is competitive against competitor products such as the Samsung 850 PRO 512GB (~$0.56/GB) and the SanDisk Extreme PRO 480GB (~$0.58/GB). 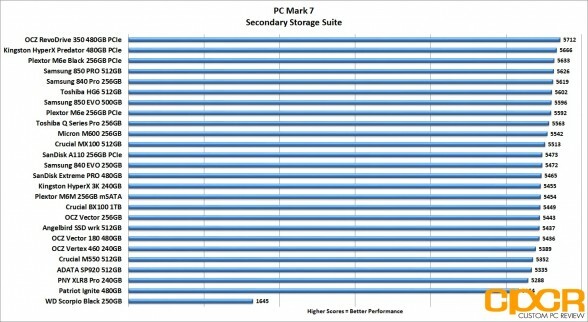 As expected, the least expensive drive in the Vector 180 lineup is the 960GB capacity, which currently retails for ~$0.52/GB. 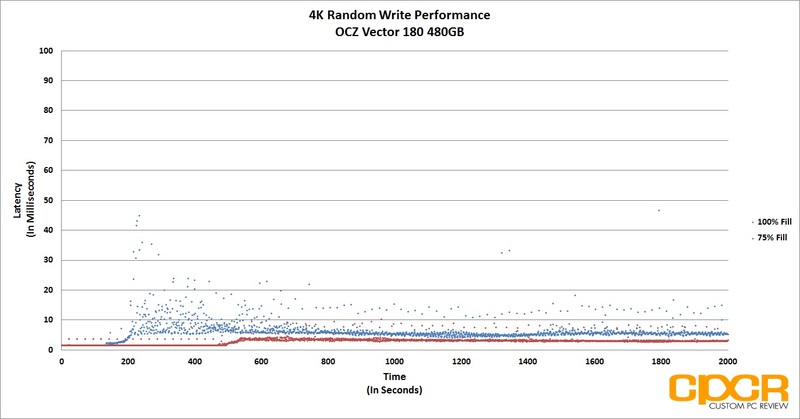 Overall the OCZ Vector 180 is a decent product for general client use and I’m quite a bit more confident in the reliability of the Barefoot 3 controller and the onboard NAND than I was when the original Vector was released. 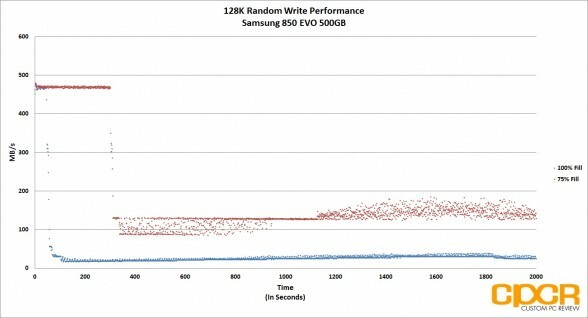 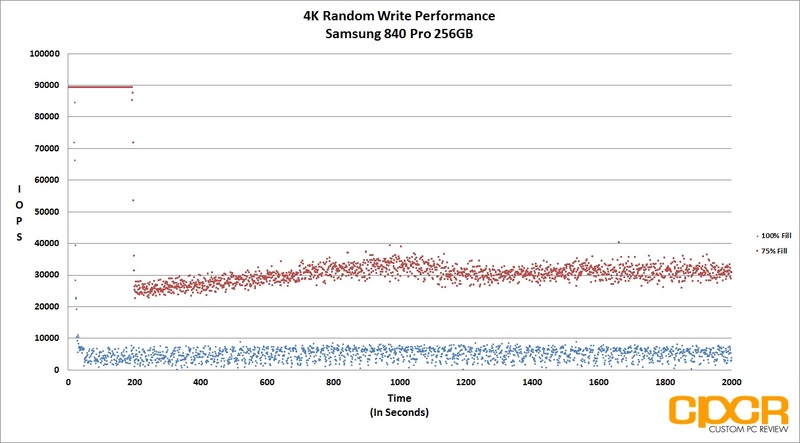 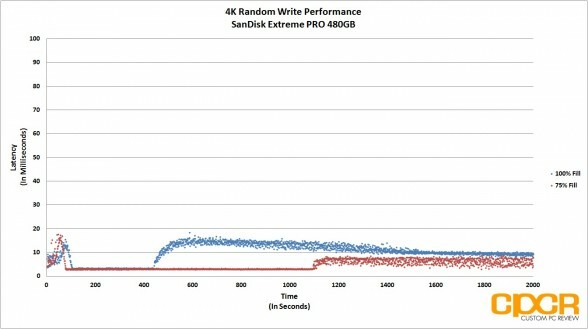 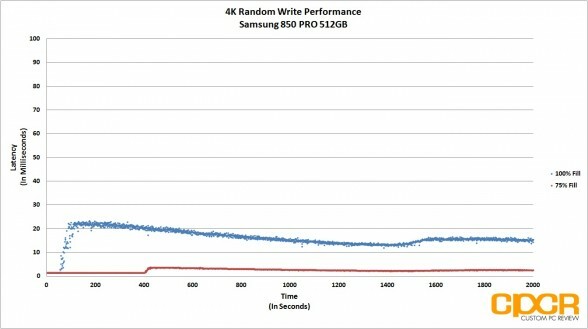 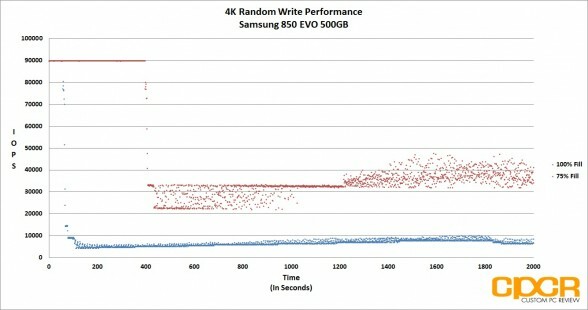 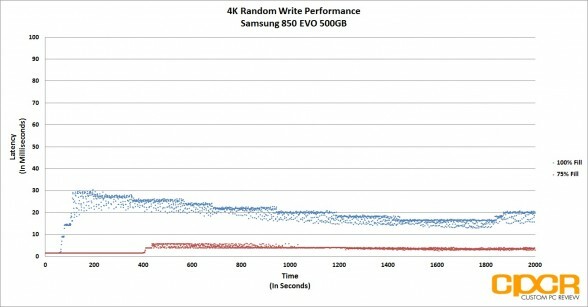 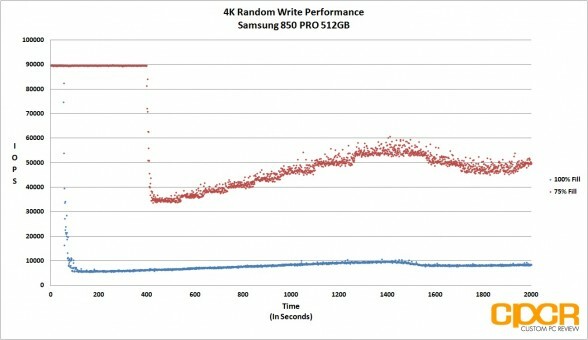 Additionally, it seems like OCZ is really pulling all the stops to address any reliability concerns they’ve seen over the past few years, but amid issues with write consistency, I feel like the Samsung 850 PRO and the SanDisk Extreme PRO are simply better options at a relatively similar pricepoint. 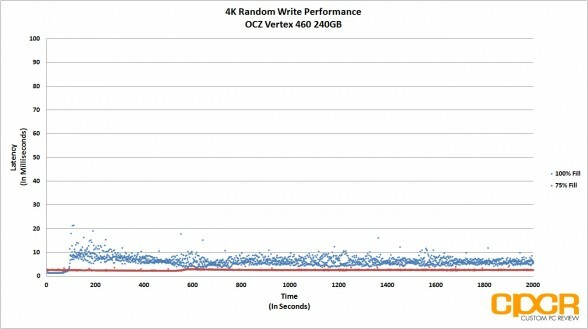 If you happen to come across a really great deal on the OCZ Vector 180, then there’s no reason not to jump on it as it’s still a great product for lighter workloads, but otherwise, I’d probably recommend waiting for OCZ to launch JetExpress powered SSDs which are expected to be coming later this year.